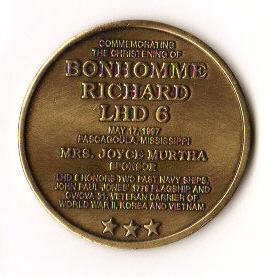 Laid down, 28 June 1995, at Litton-Ingalls Shipbuilding Corp. Pascagoula, MS.
70k USS Bonhomme Richard (LHD-6) underway, date and location unknown. 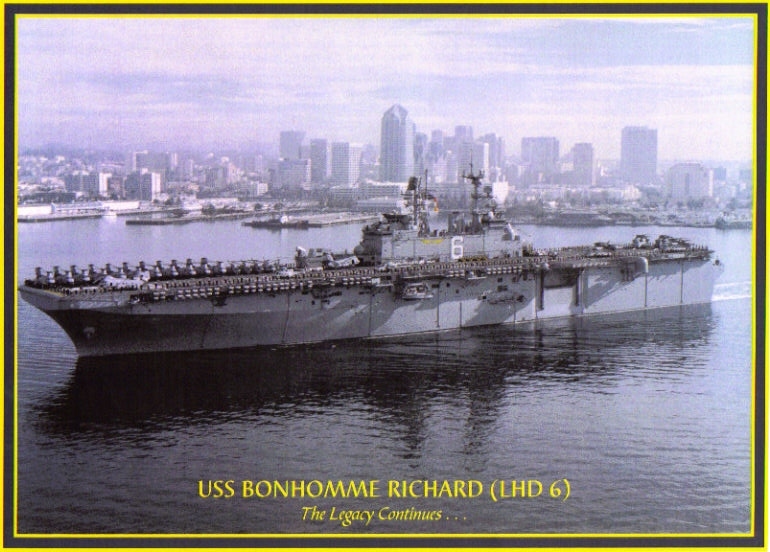 35k USS Bonhomme Richard (LHD-6) underway, date and location unknown. 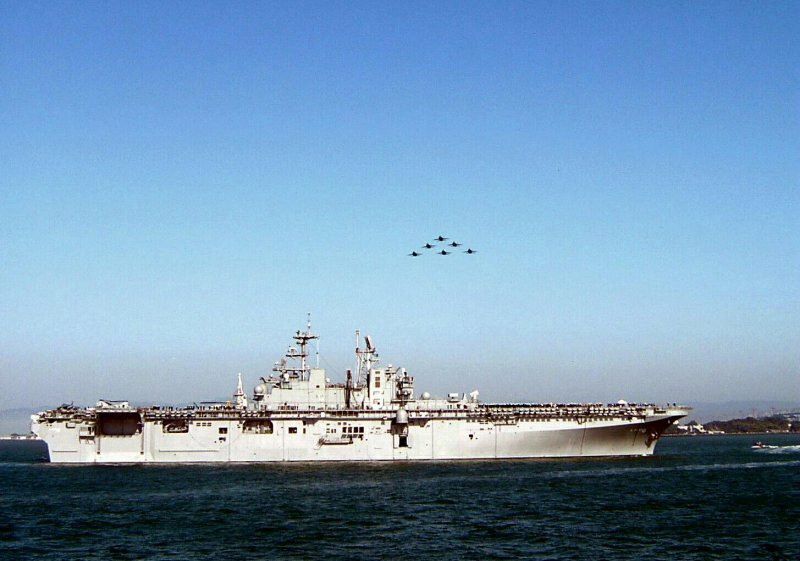 186k USS Bonhomme Richard (LHD-6) underway, circa May 2001, location unknown. 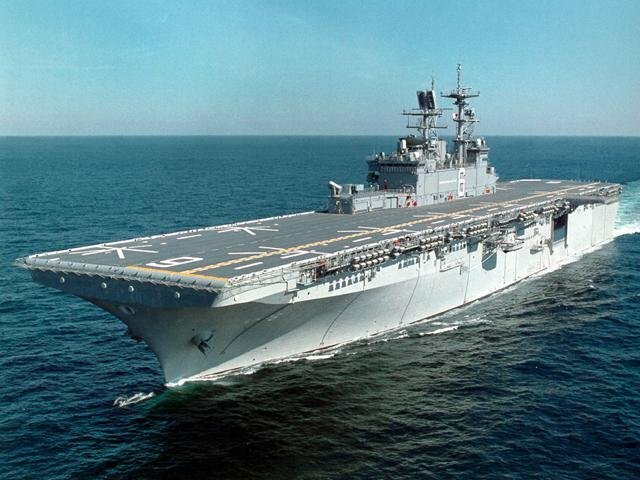 030127-N-1352S-017 2700k USS Bonhomme Richard (LHD-6) at sea, 27 January 2003, while deployed with the seven-ship Amphibious Task Force West (ATF-W) in support of Operation Enduring Freedom (OEF) from her homeport of San Diego, CA. 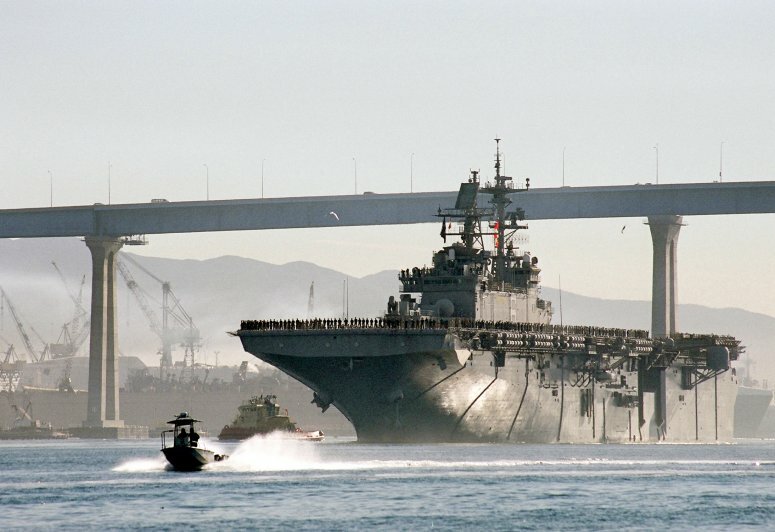 70k USS Bonhomme Richard (LHD-6) passes under the Coronado bridge as she makes her way out of the San Diego Bay, 17 January 2003. 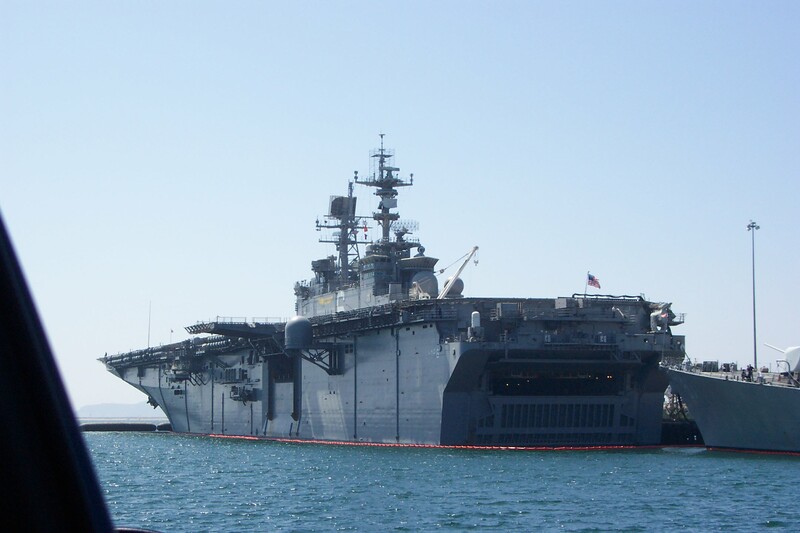 The USS Bonhomme Richard and Amphibious Task Force West (ATF-W) have deployed in support of Operation Enduring Freedom. 53k USS Bonhomme Richard (LHD-6) sailors man the rails as the amphibious assault ship heads to sea for an unscheduled deployment in support of U.S. interests, 17 January 2003. 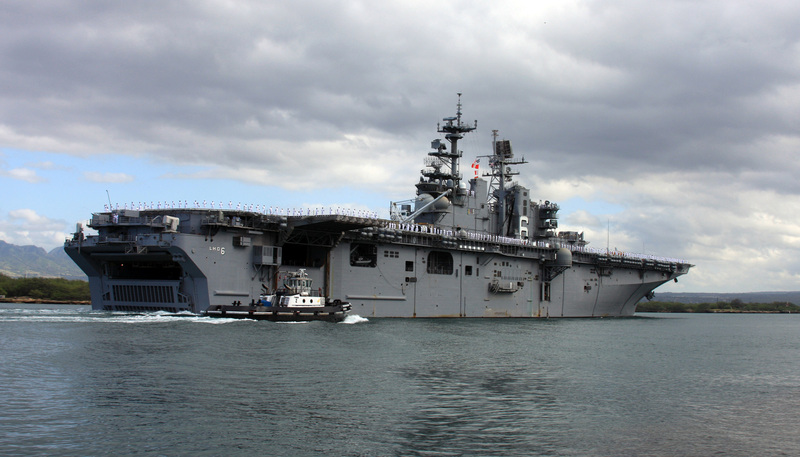 USS Bonhomme Richard is part of the 7-ship Amphibious Task Force West (ATF-W). 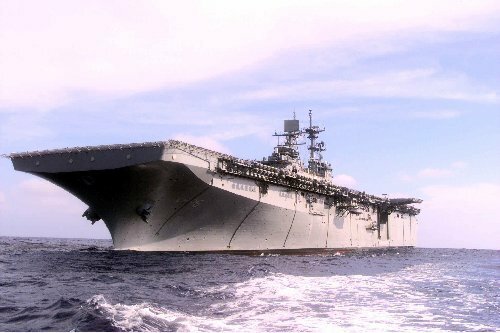 030117-N-2069B-008 61k USS Bonhomme Richard (LHD-6) heads to sea for an unscheduled deployment in support of U.S. interests, 17 January 2003. 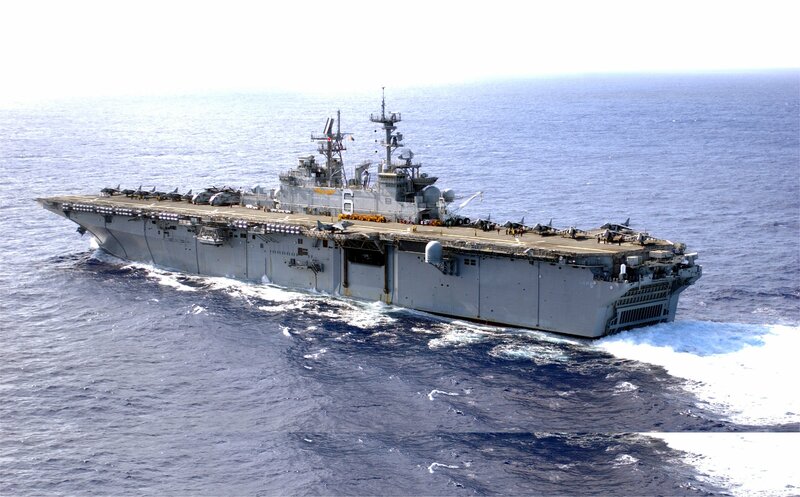 43k USS Bonhomme Richard (LHD-6) underway in the Indian Ocean, 16 January 2005. 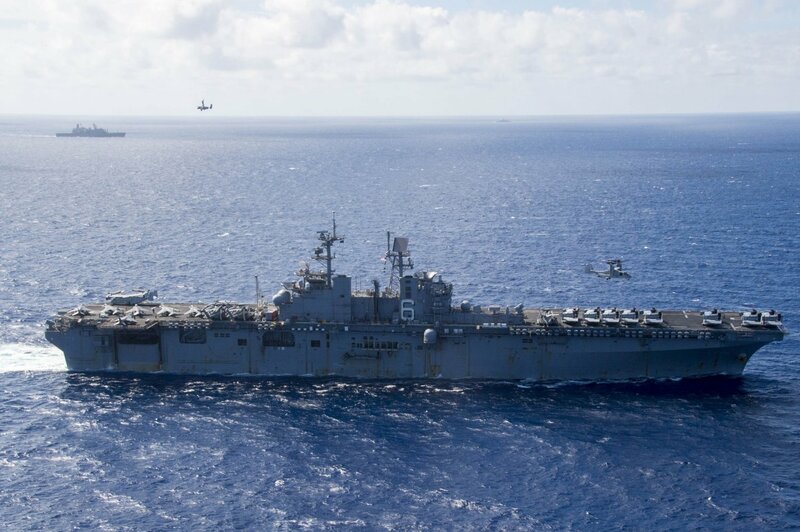 The Bonhomme Richard Expeditionary Strike Group is/was operating in the Indian Ocean off the coast of Indonesia and Thailand in support of Operation Unified Assistance, the humanitarian operation effort in the wake of the Tsunami that struck South East Asia. 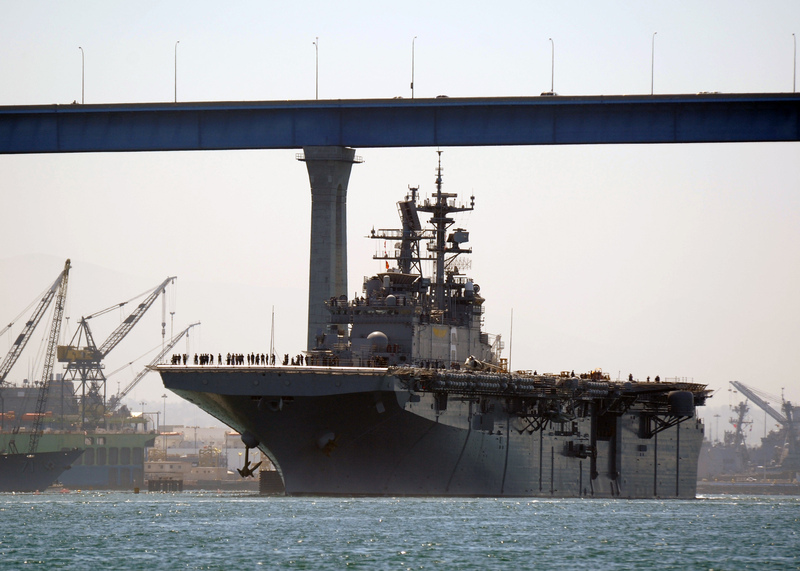 46k USS Bonhomme Richard (LHD-6) moored pierside at Naval Station San Diego, July 2005. Photo by Richard Miller BMCS USNR Ret. 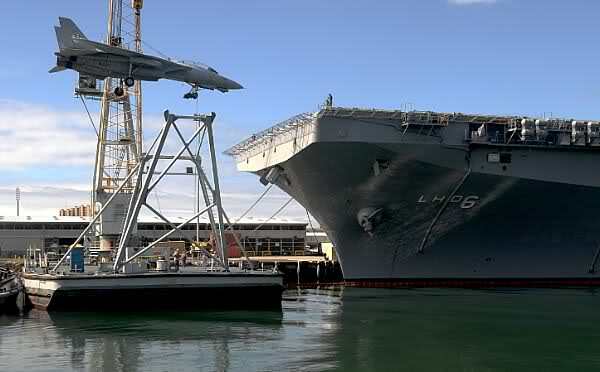 269k USS Bonhomme Richard (LHD-6) moored at Naval Station San Diego, pier 3, May 2006. Photo by Richard Miller BMCS USNR Ret. 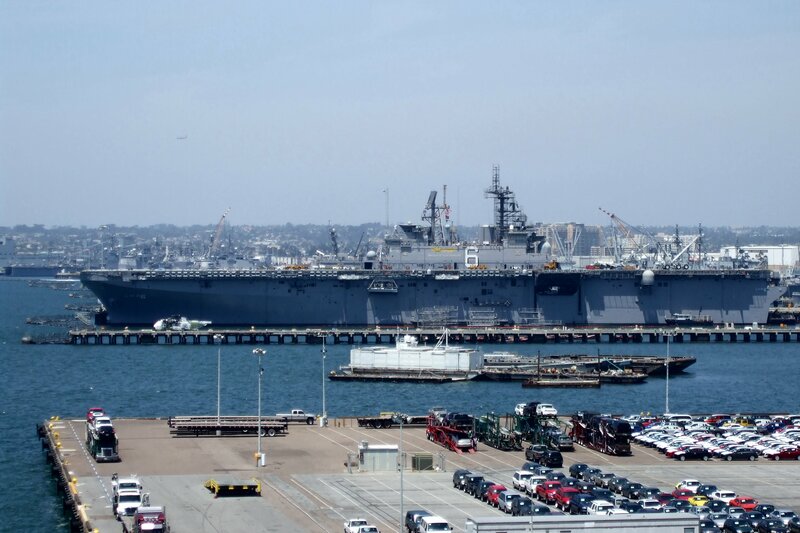 434k USS Bonhomme Richard (LHD-6) moored at Naval Station San Diego, pier 3, May 2006. Photo by Richard Miller BMCS USNR Ret. 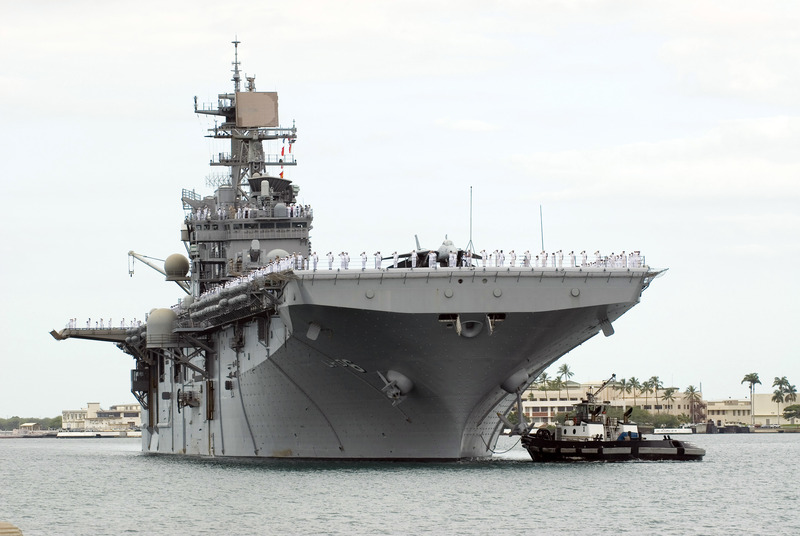 97k USS Abraham Lincoln (CVN-72) moored at Pearl Harbor, Hawaii, 27 July 2006, after her participation in RIMPAC 2006. 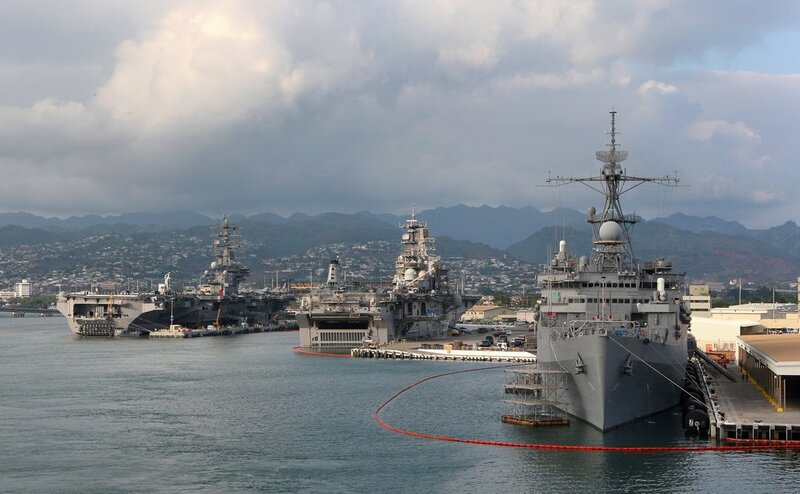 Also present are USS Bonhomme Richard (LHD-6) and the fleet oiler USS Pecos (T-AO 197) and a second, unidentified fleet oiler. 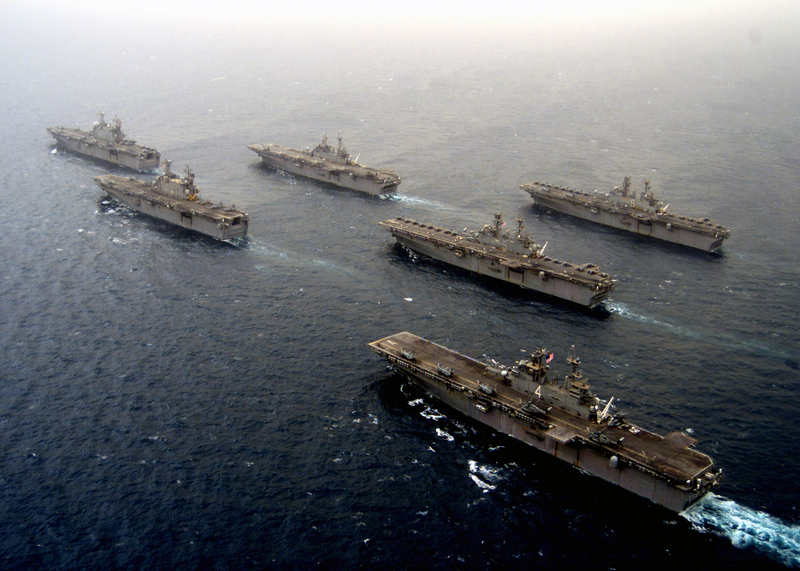 807k USS Bonhomme Richard (LHD-6) sails in formation with ships and submarines from the U.S. Navy as well as the Navies of the seven other nations, on 25 July 2006. 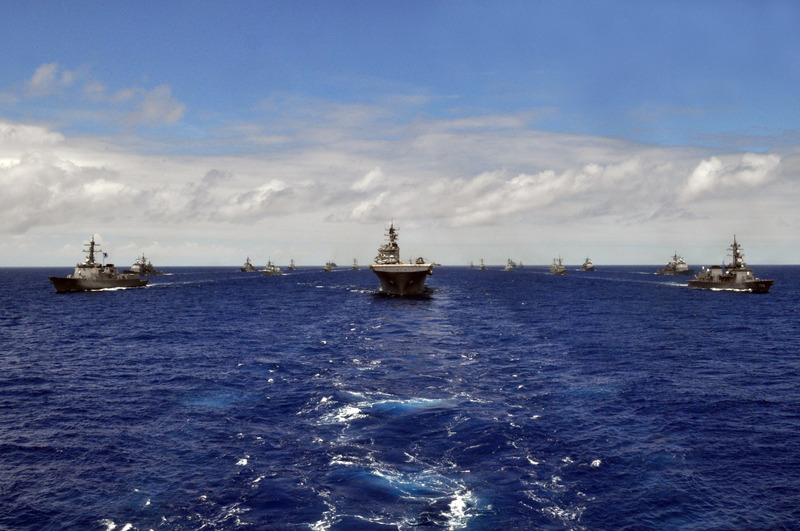 To commemorate the last day of the 2006 Rim of the Pacific (RIMPAC) exercise, participating country's naval vessels fell into ranks for a photo exercise. RIMPAC trains U.S. allied forces to be interoperable and ready for a wide range of potential combined operations and missions. 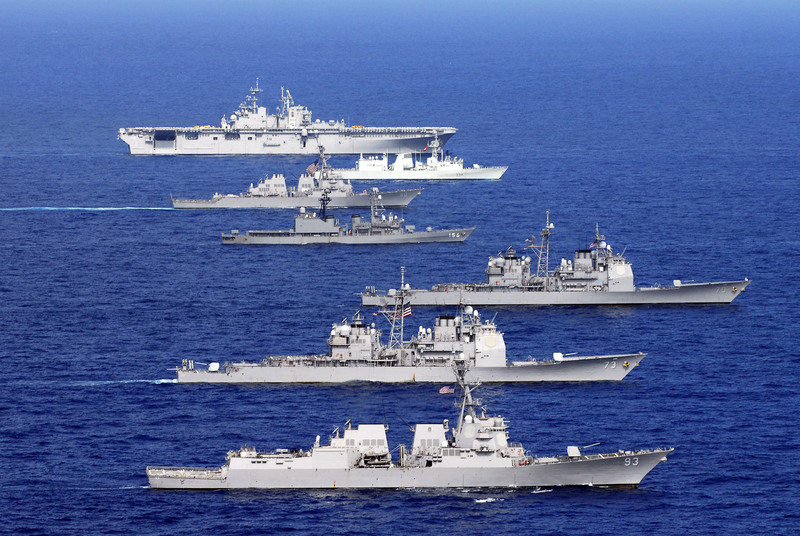 Eight nations participated in RIMPAC, the world's largest biennial maritime exercise. 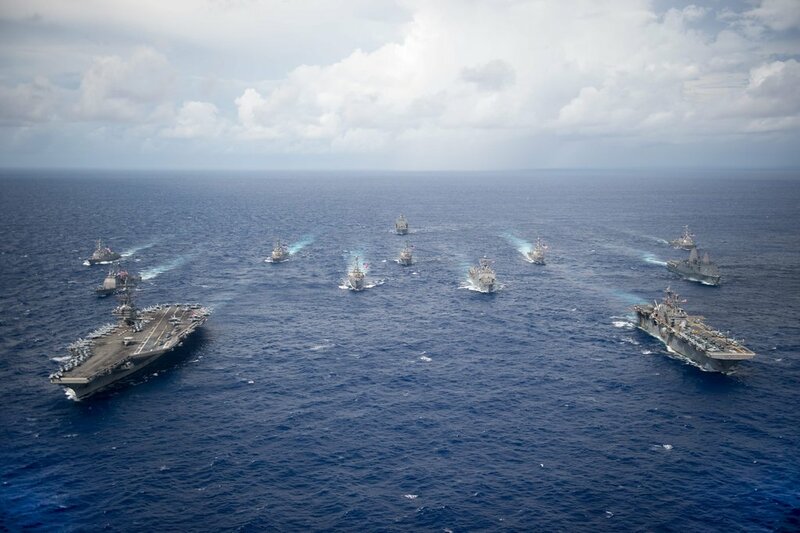 Conducted in the waters off Hawaii, RIMPAC brings together military forces from Australia, Canada, Chile, Peru, Japan, the Republic of Korea, the United Kingdom and the United States. 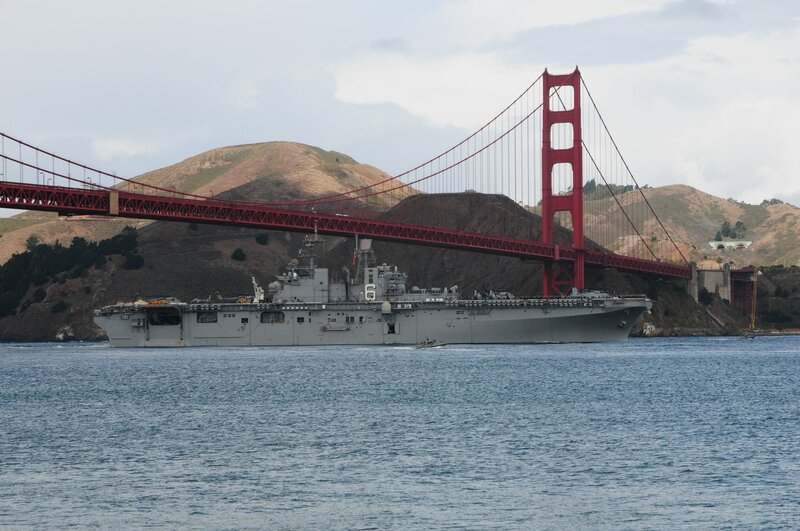 81k USS Bonhomme Richard (LHD-6) passing under the Golden Gate Bridge during Fleet Week Parade of Ships, 7 October 2006.. Photo by CAPT. Jack C. Goldthorpe, USCG Ret. 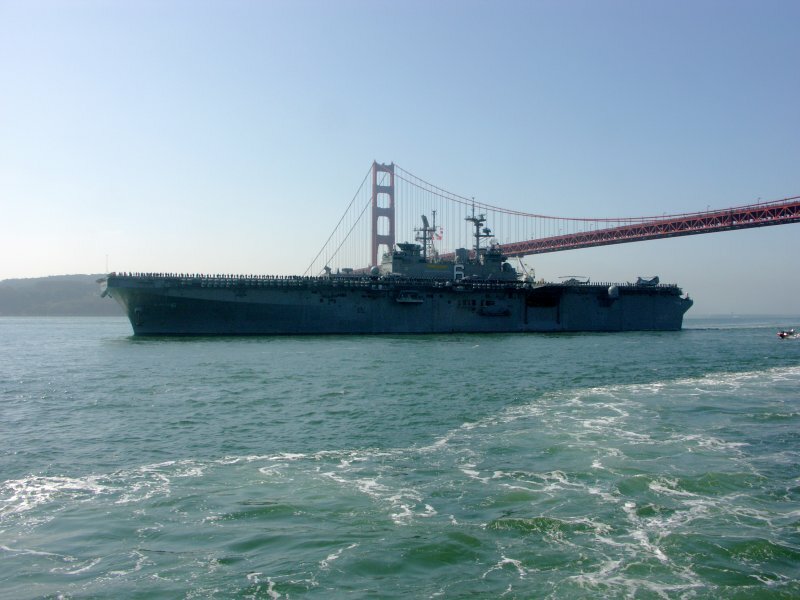 76k USS Bonhomme Richard (LHD-6) passing under the Golden Gate Bridge during Fleet Week Parade of Ships, 7 October 2006. Photo by CAPT. Jack C. Goldthorpe, USCG Ret. 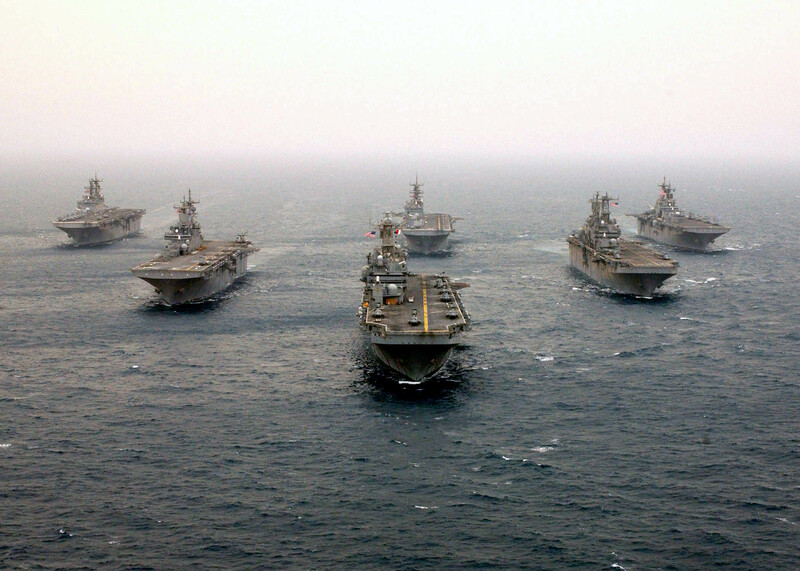 150k From top to bottom USS John C. Stennis (CVN-74), USS Bonhomme Richard (LHD-6) and USS Nimitz (CVN-68), transit the Gulf of Oman, 22 May 2007. 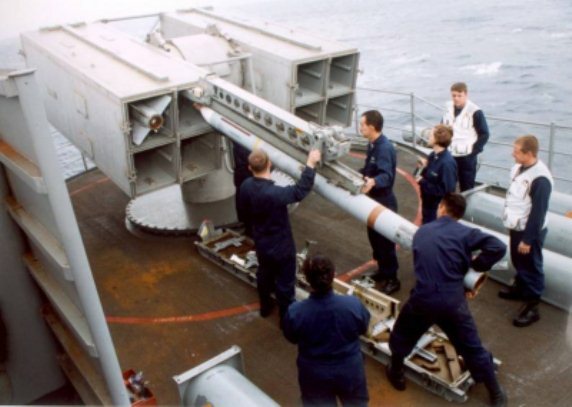 The three ships were flagships for three different strike groups, which were on regularly, scheduled deployments in support of Maritime Operations. 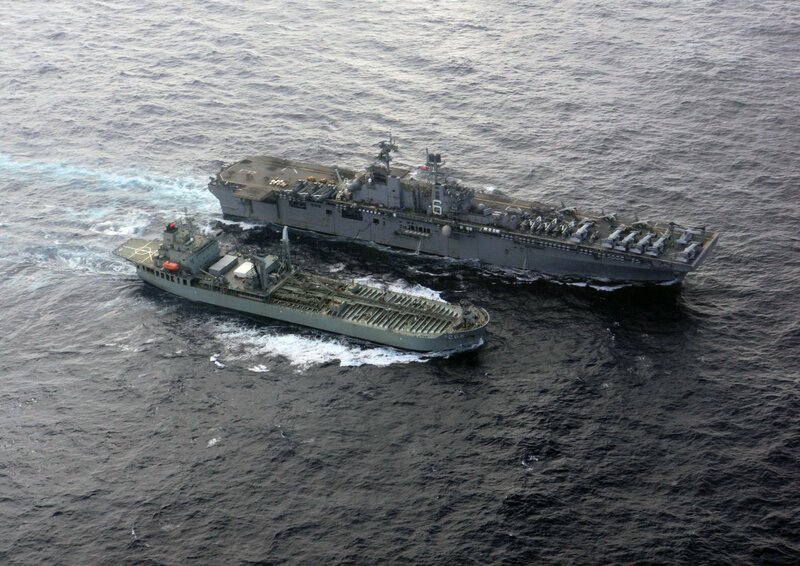 232k USS Bonhomme Richard (LHD-6) and USS Denver (LPD-9) steam through the Gulf of Oman, 22 May 2007. 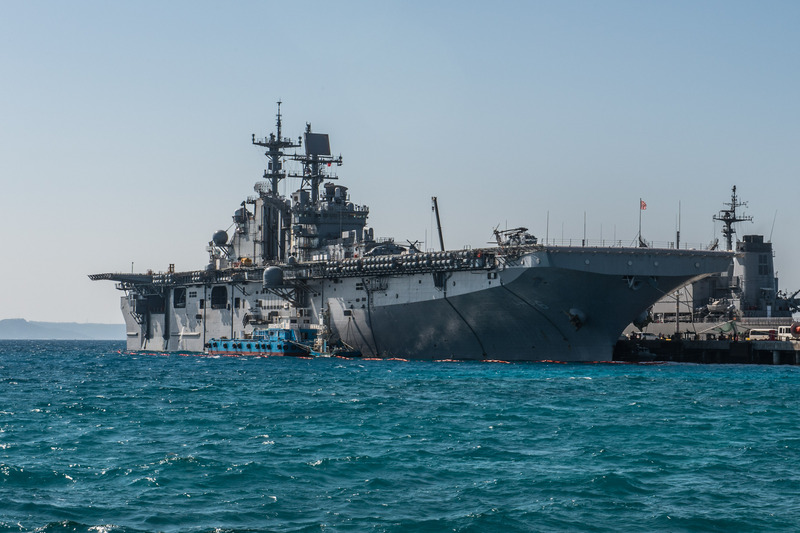 USS Bonhomme Richard and USS Denver, as part of the Bonhomme Richard Expeditionary Strike Group, are on regularly scheduled deployments in support of Maritime Operations. Maritime Operations help set the conditions for security and stability, as well as complement counter-terrorism and security efforts to regional nations. 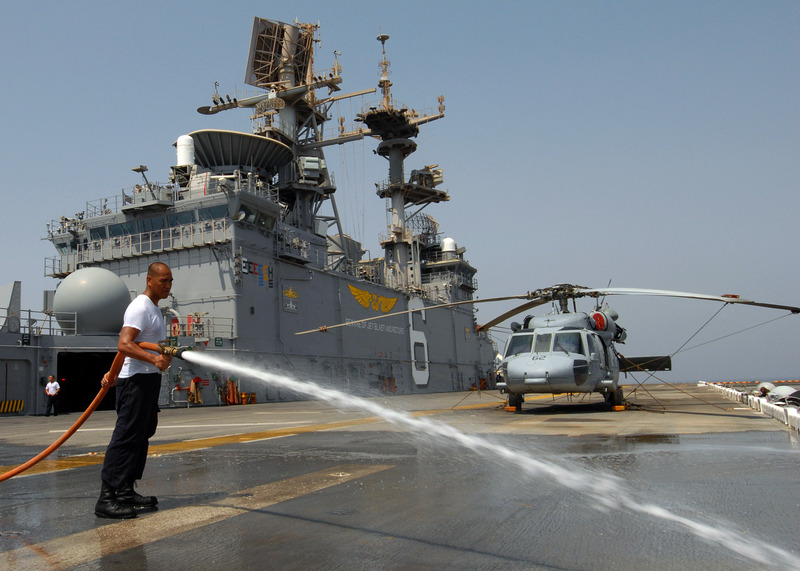 546k ABHAN Lawrence Llorente, a native of Vigan City, Philippines, uses a fire hose to wash salt off the flight deck during a fresh water wash down aboard USS Bonhomme Richard (LHD-6), 7 August 2007. These are conducted routinely to remove salt in order to prevent corrosion. 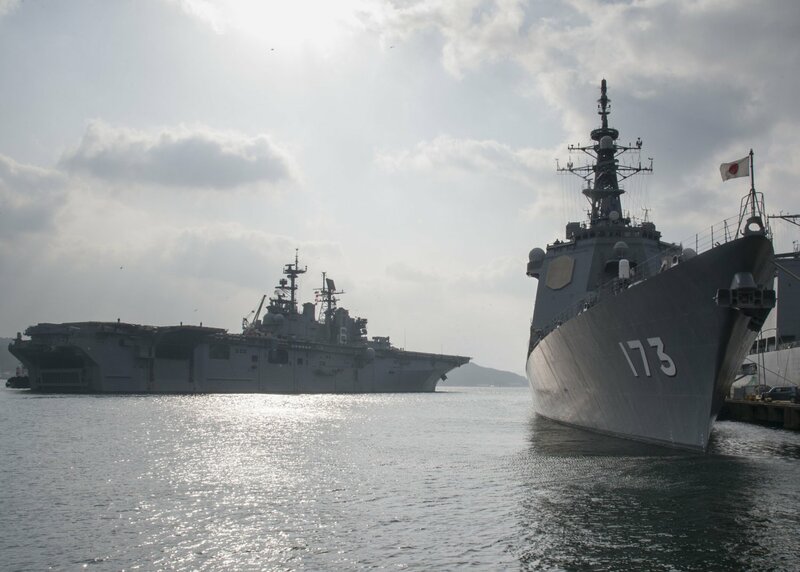 The BHR Expeditionary Strike Group (ESG) is operating in the U.S. 5th Fleet Area of Operations and will be conducting Maritime Security Operations (MSO). 145k USS Bonhomme Richard (LHD-6) off the coast of Oahu, 27 July 2008, shortly before coming about and launching 4 helicopters on the day of her arrival for RIMPAC 2008. 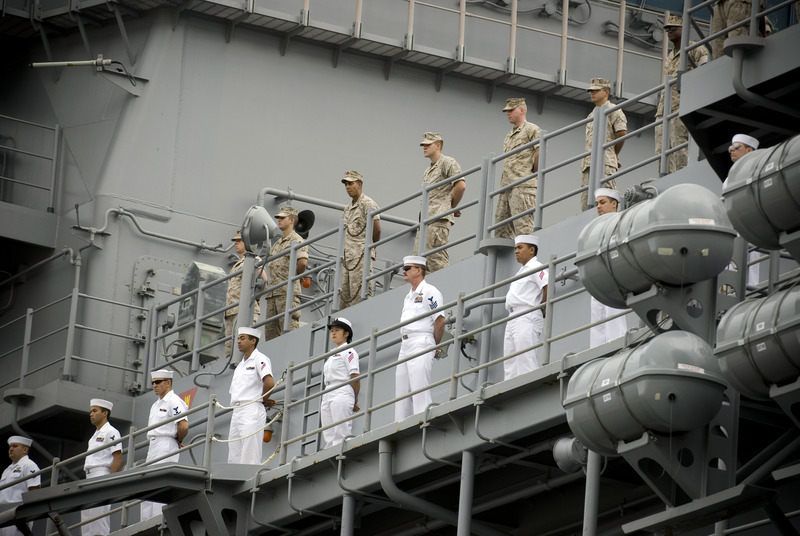 2304k Sailors and marines man the rails as USS Bonhomme Richard (LHD-6) arrives at Naval Station Pearl Harbor for a scheduled port call before participating in the Rim of the Pacific (RIMPAC) 2008. 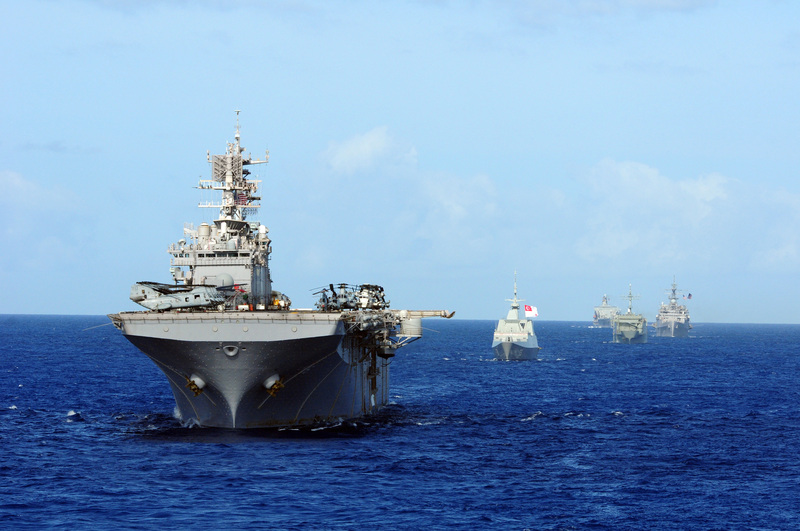 RIMPAC is the world's largest multinational exercise and is scheduled biennially by the U.S. Pacific Fleet. Participants include the United States, Australia, Canada, Chile, Japan, the Netherlands, Peru, Republic of Korea, Singapore, and the United Kingdom. 627k USS Bonhomme Richard (LHD-6) Sailors and marines man the rails as USS Bonhomme Richard (LHD-6) arrives at Naval Station Pearl Harbor for a scheduled port call before participating in the Rim of the Pacific (RIMPAC) 2008. RIMPAC is the world's largest multinational exercise and is scheduled biennially by the U.S. Pacific Fleet. Participants include the United States, Australia, Canada, Chile, Japan, the Netherlands, Peru, Republic of Korea, Singapore, and the United Kingdom. 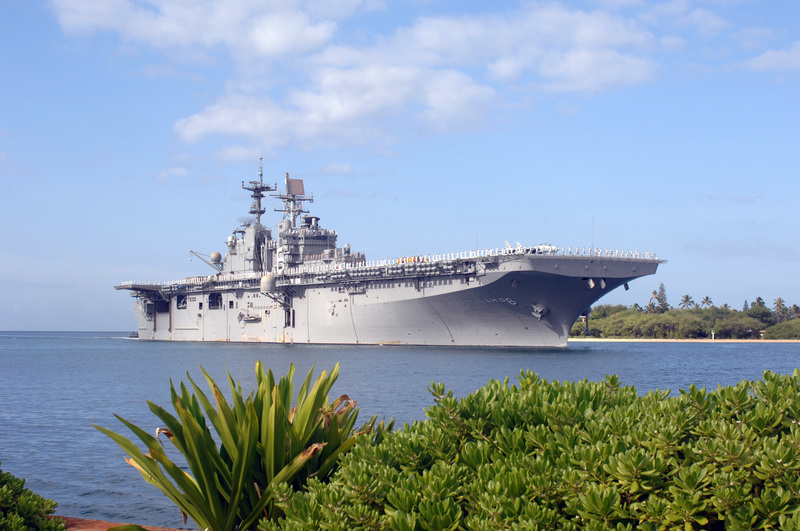 1407k USS Bonhomme Richard (LHD-6) arrives at Naval Station Pearl Harbor for Rim of the Pacific exercise (RIMPAC) 2008. RIMPAC is the world's largest multinational exercise and is scheduled biennially by the U.S. Pacific Fleet. Participants include the United States, Australia, Canada, Chile, Japan, the Netherlands, Peru, Republic of Korea, Singapore, and the United Kingdom. 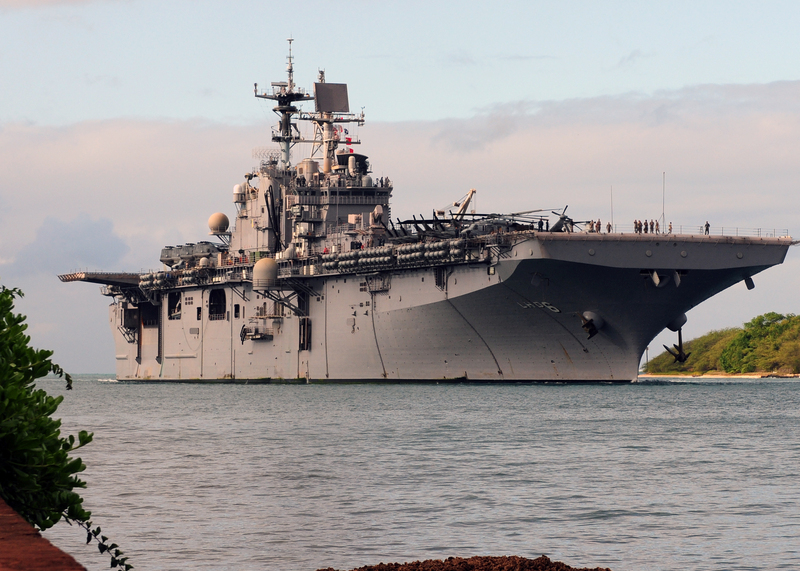 1581k USS Bonhomme Richard (LHD-6) moors pierside at Naval Station Pearl Harbor for Rim of the Pacific (RIMPAC) 2008. RIMPAC is the world's largest multinational exercise and is scheduled biennially by the U.S. Pacific Fleet. Participants include the United States, Australia, Canada, Chile, Japan, the Netherlands, Peru, Republic of Korea, Singapore, and the United Kingdom. 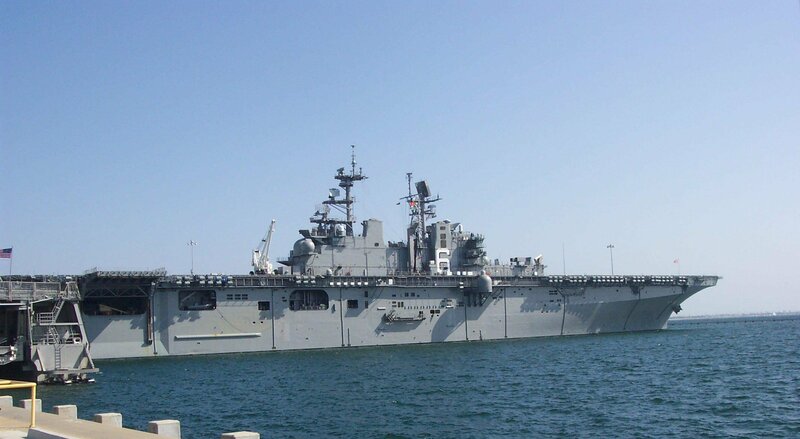 1441k USS Bonhomme Richard (LHD-6) moored pierside at Naval Station Pearl Harbor for Rim of the Pacific (RIMPAC) 2008. 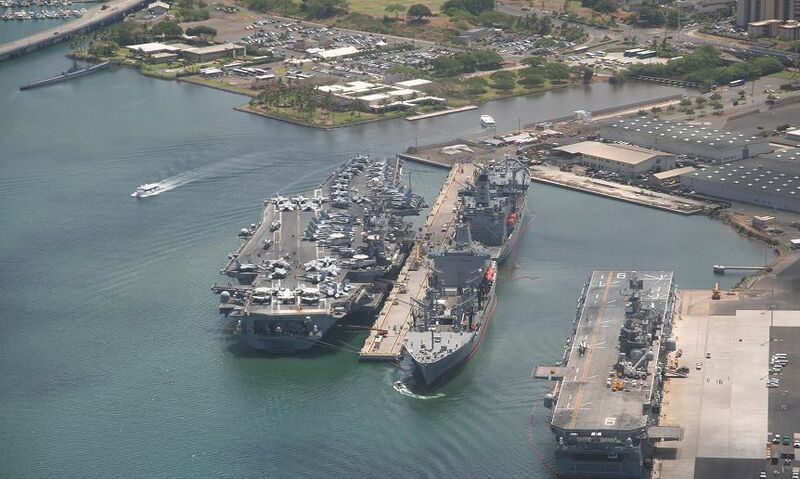 RIMPAC is the world's largest multinational exercise and is scheduled biennially by the U.S. Pacific Fleet. Participants include the United States, Australia, Canada, Chile, Japan, the Netherlands, Peru, Republic of Korea, Singapore, and the United Kingdom. 32k F-14D Tomcat VF-32 "Felix 102" Bureau Number 163904 lifted by crane from USS Bonhomme Richard (LHD-6) at Pearl Harbor. The F-14D was loaded aboard Bonhomme Richard at San Diego and delivered to the Pacific Aviation Museum, 27 June 2008. 781k Four landing signal enlisted personnel prepare to launch CH-53D Sea Stallions assigned to Heavy Marine Helicopter Squadron Three Six Two (HMH-362) "Ugly Angels" from the flight deck of USS Bonhomme Richard (LHD-6) during flight operations, 26 July 2008. 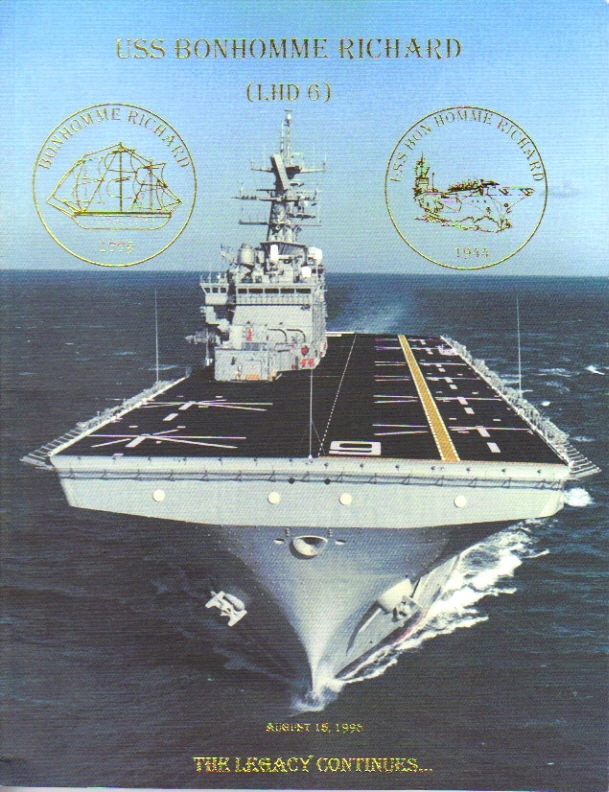 Bonhomme Richard is participating in Rim of the Pacific 2008, (RIMPAC 2008). 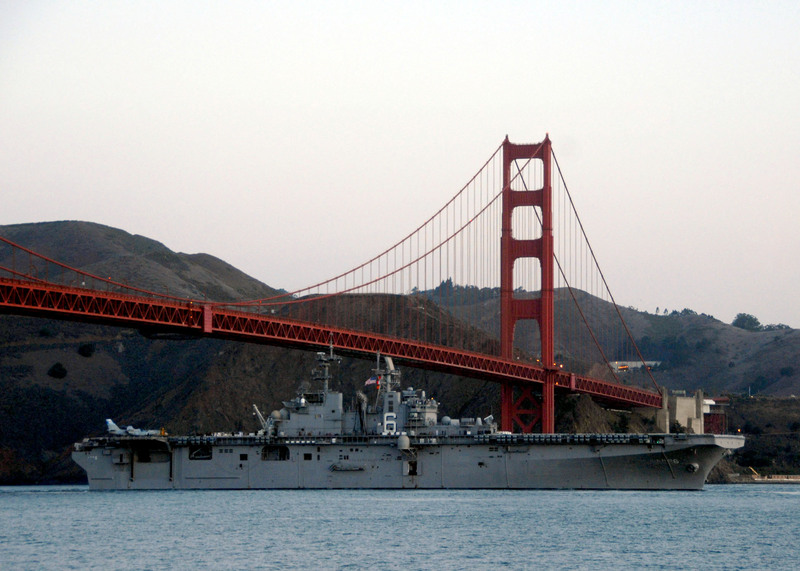 387k USS Bonhomme Richard (LHD-6) steams under the Golden Gate Bridge, as she enters San Francisco Bay to participate in San Francisco Fleet Week 2008. 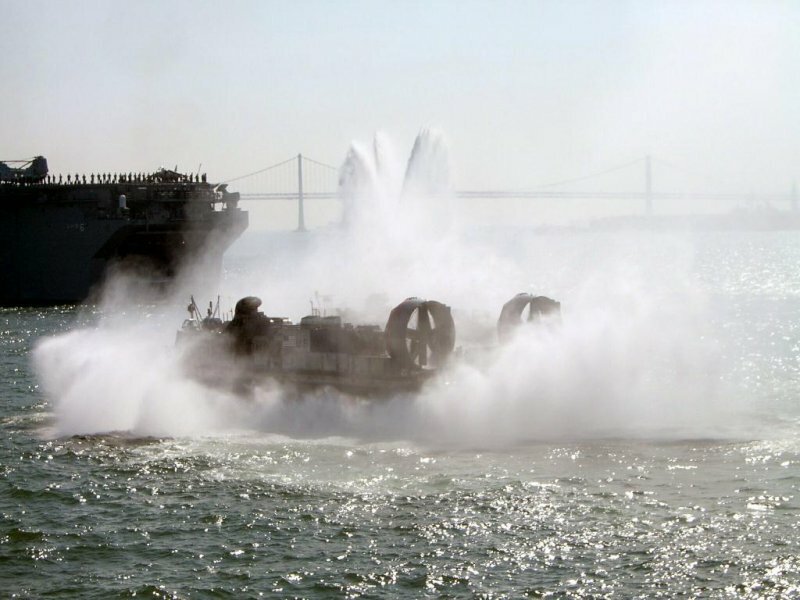 The event is an opportunity to showcase military personnel, equipment, technology and capabilities while highlighting naval history within the San Francisco area. 363k USS Bonhomme Richard (LHD-6) steams past Alcatraz State Park as she participates in the 27th annual San Francisco Fleet Week celebration. 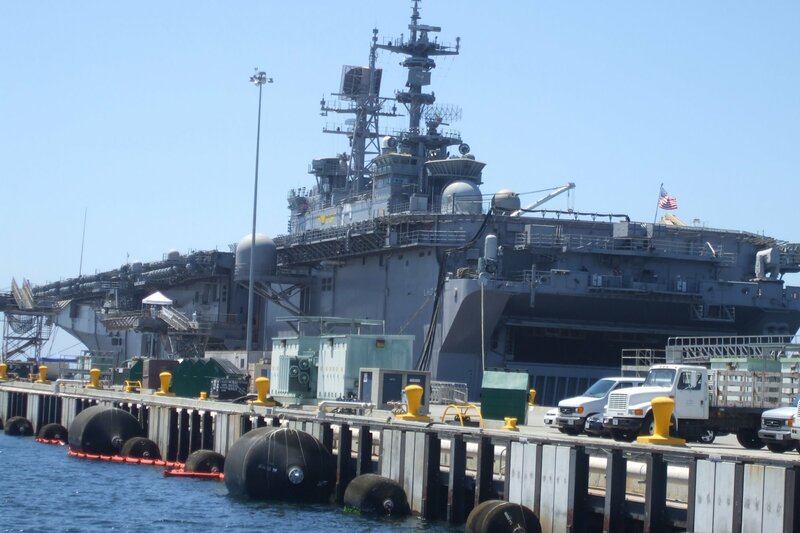 1099k USS Bonhomme Richard (LHD-6) moored at Naval Station San Diego, CA. in May 2009 Richard Miller BMCS USNR Ret. 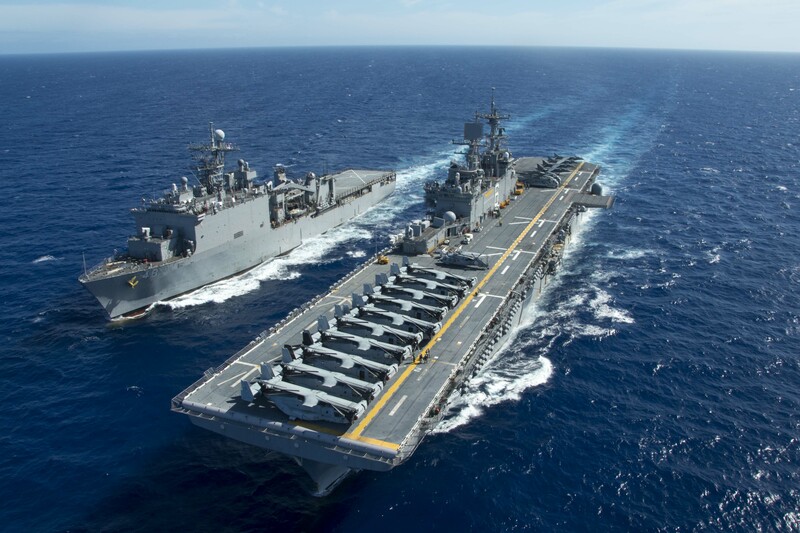 1682k USS Bonhomme Richard (LHD-6) prepares to come along side the fleet replenishment Oiler USNS Yukon (T-AO-202) during an underway replenishment. 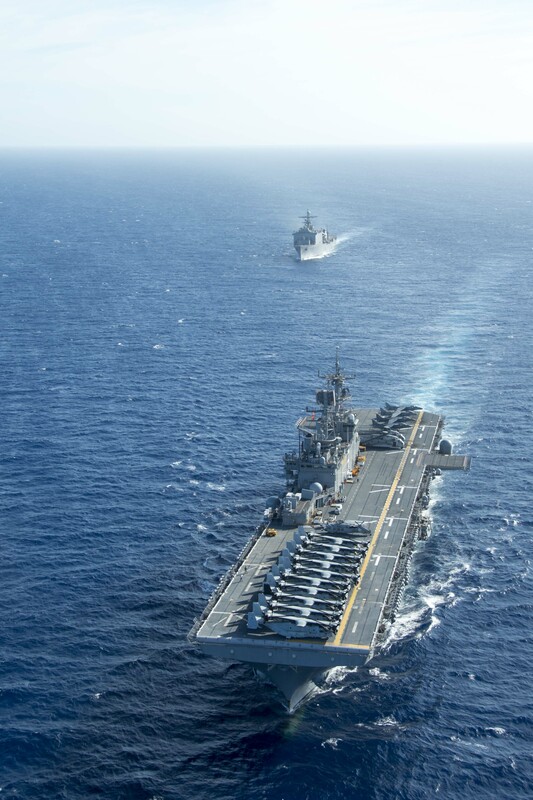 Bonhomme Richard, is underway conducting a Composite Training Unit Exercise (COMPTUEX) in preparation for a scheduled Pacific deployment later this year. 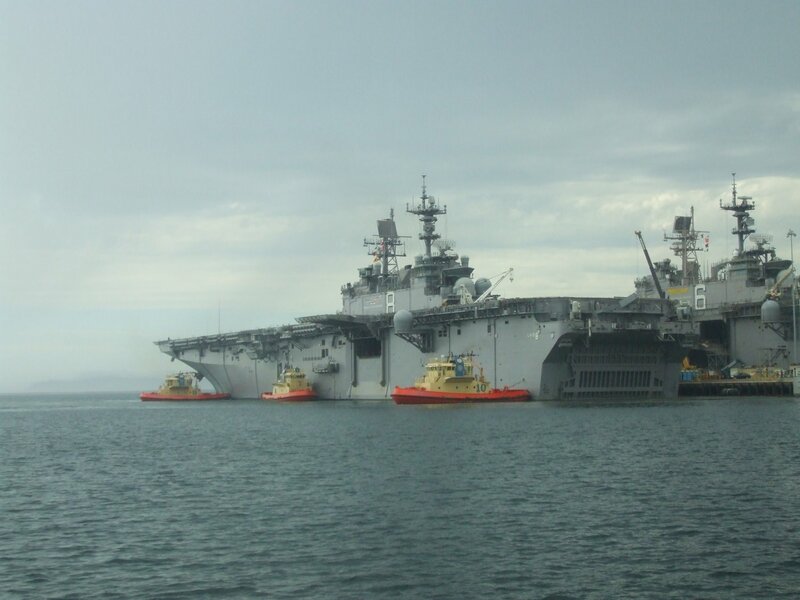 672k Tugs boats guide USS Bonhomme Richard (LHD-6) as she turns into San Diego Bay. 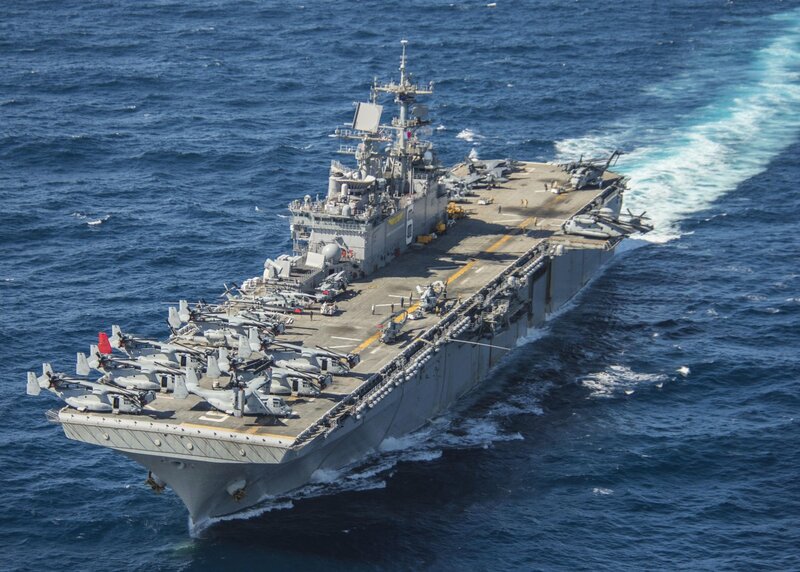 Bonhomme Richard and the embarked 11th Marine Expeditionary Unit departed on a regularly scheduled western Pacific deployment. 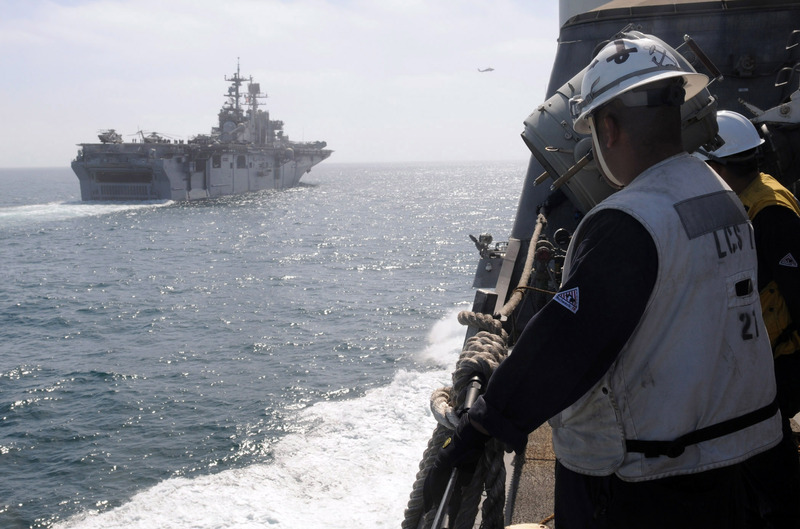 462k Chief Boatswain's Mate Francisco Valdovinos, assigned to the littoral combat ship USS Freedom (LCS-1), watches as Freedom approaches USS Bonhomme Richard (LHD-6) for a refueling at sea. 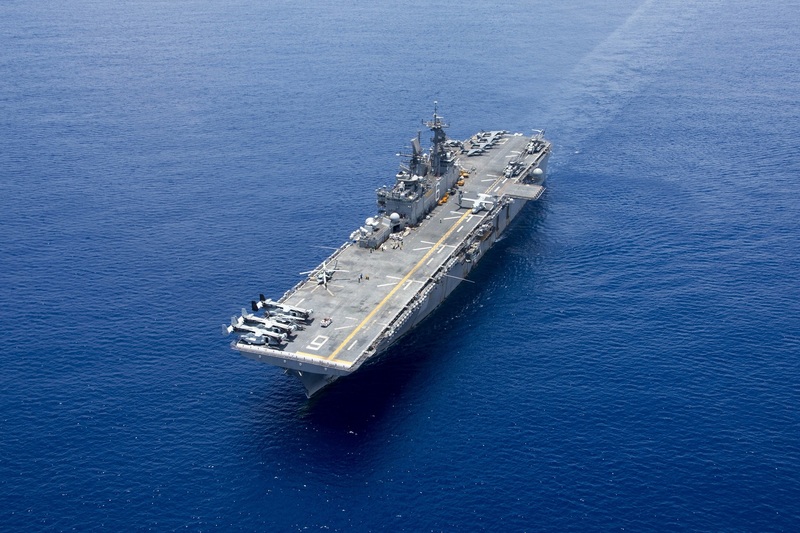 Freedom and Bonhomme Richard are scheduled to participate in Rim of the Pacific (RIMPAC) 2010, the world's largest international maritime exercise. 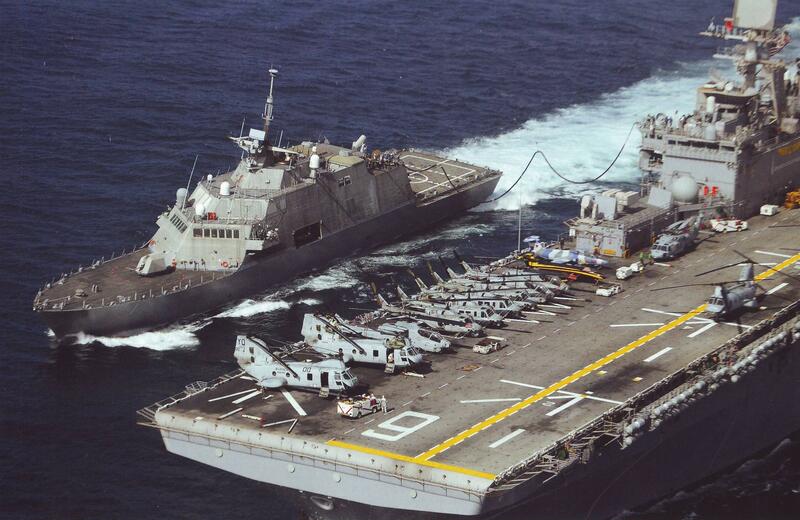 291k USS Bonhomme Richard (LHD-6) prepares for a refueling at sea with the littoral combat ship USS Freedom (LCS-1). 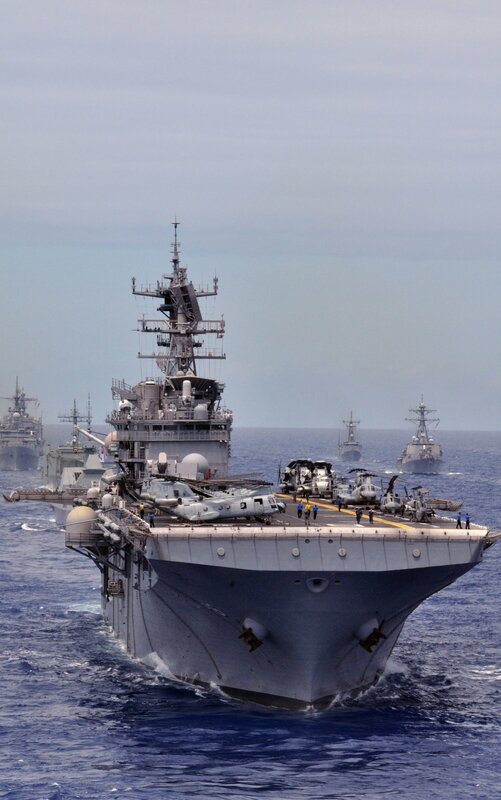 Freedom and Bonhomme Richard are scheduled to participate in Rim of the Pacific (RIMPAC) 2010, the world's largest international maritime exercise. 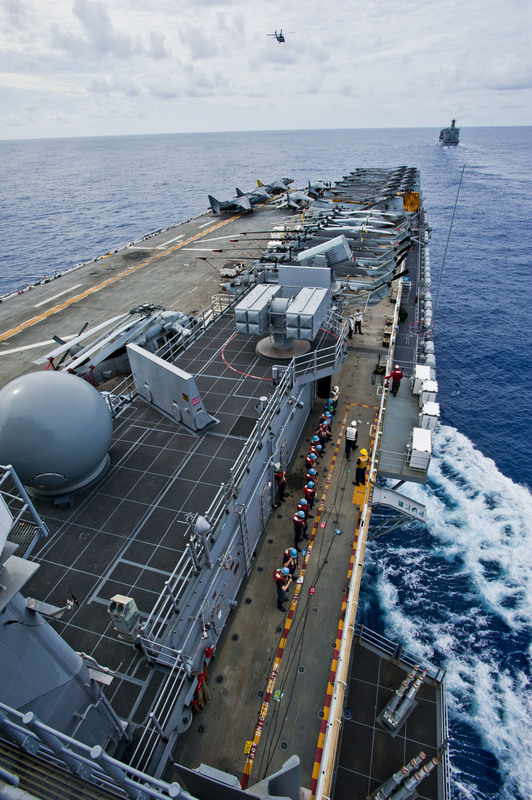 629k USS Bonhomme Richard (LHD-6) conducts a replenishment at sea with the littoral combat ship USS Freedom (LCS-1). 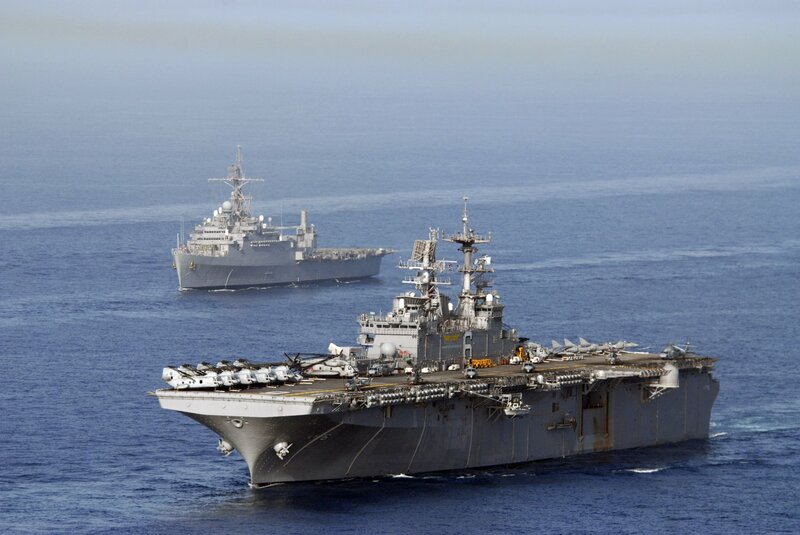 Freedom and Bonhomme Richard are scheduled to participate in Rim of the Pacific (RIMPAC) 2010, the world's largest international maritime exercise. 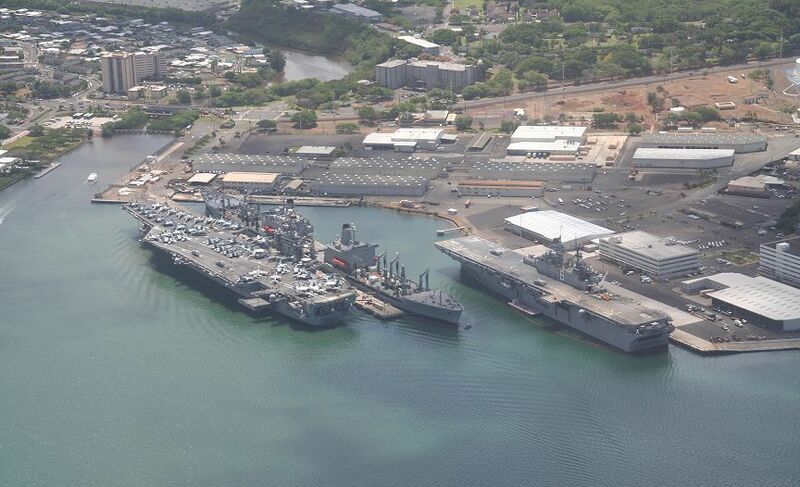 115k USS Ronald Reagan (CVN-76), left, the amphibious assault ship USS Bonhomme Richard (LHD-6) and the amphibious transport dock ship USS Cleveland LPD-7), 28 June 2010, pierside at Joint Base Pearl Harbor-Hickam to support Rim of the Pacific (RIMPAC) 2010 exercises. Royal Australian Navy photo by ABIS James McDougall (# 100628-O-8247M-134). 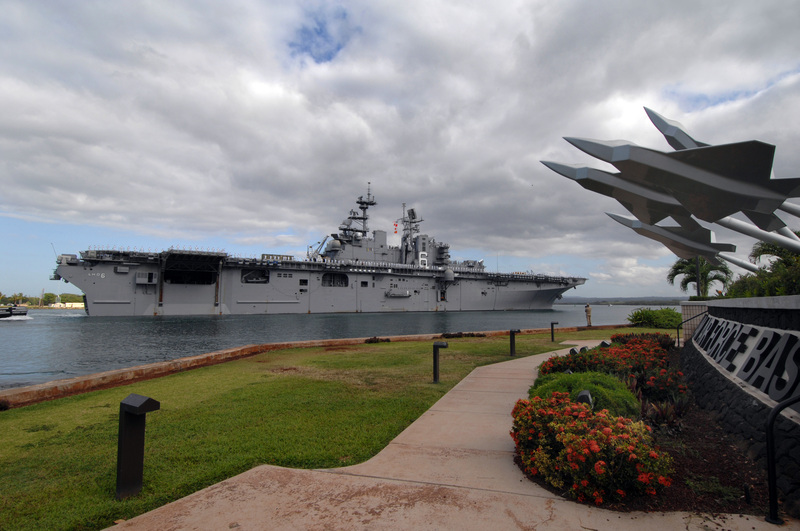 966k The amphibious landing platform HMAS Kanimbla (LPA-51) moors alongside USS Bonhomme Richard (LHD-6) at Joint Base Pearl Harbor-Hickam to participate in Rim of the Pacific (RIMPAC) 2010 exercise. 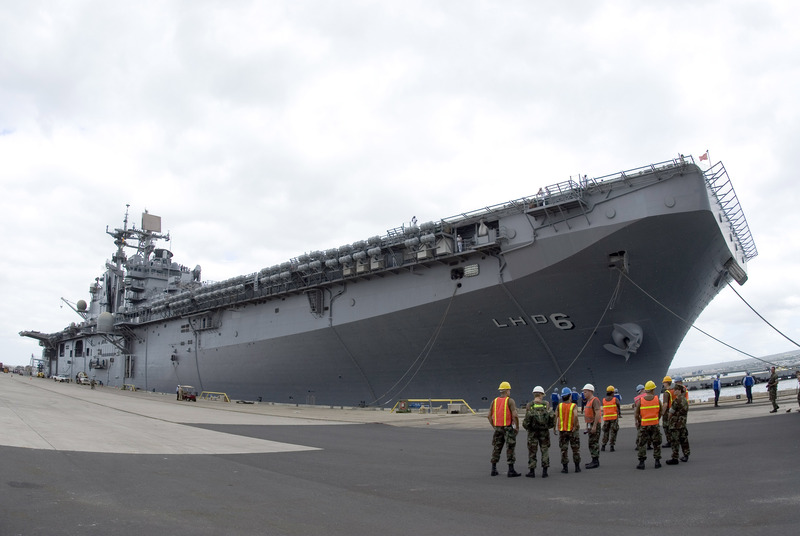 1030k USS Bonhomme Richard (LHD-6) prepares to depart Pearl Harbor, 28 June to participate in the Rim of the Pacific (RIMPAC) 2010 exercise. RIMPAC is a biennial, multinational exercise designed to strengthen regional partnerships and improve interoperability. 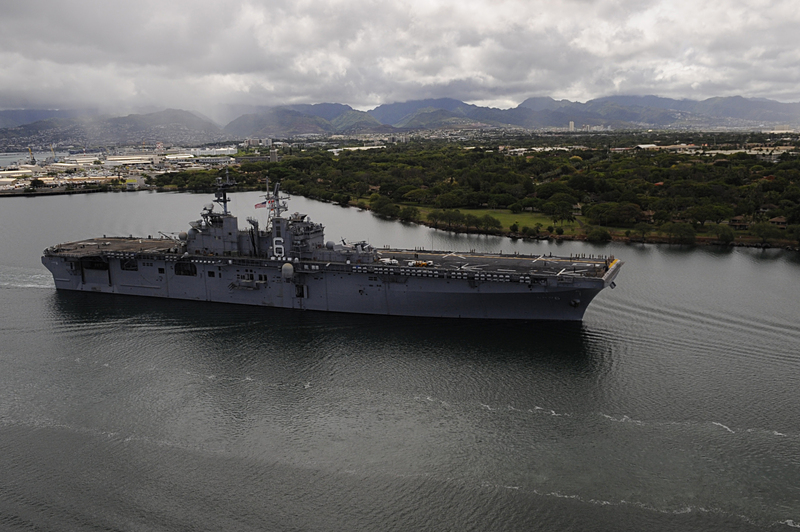 1529k USS Bonhomme Richard (LHD-6) departs Pearl Harbor, 6 July during the Rim of the Pacific (RIMPAC) 2010 exercise. RIMPAC is a biennial, multinational exercise designed to strengthen regional partnerships and improve interoperability. 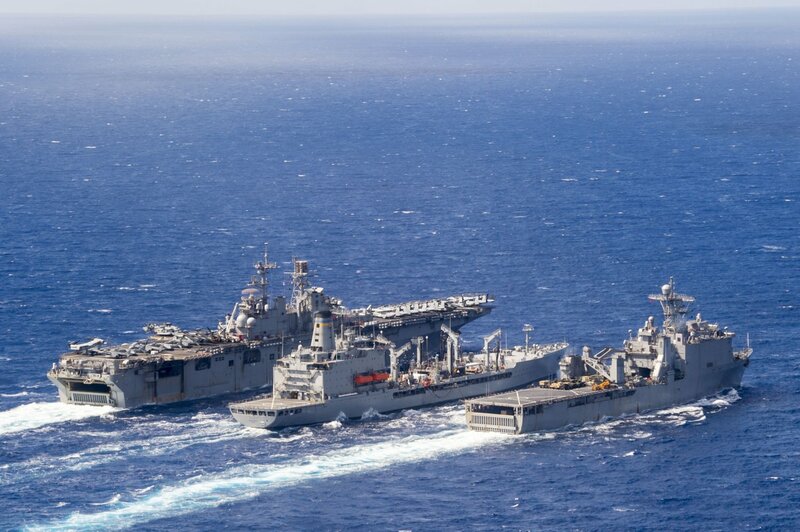 420k USNS Guadalupe (T-AO-200) refuels the amphibious assault ship USS Bonhomme Richard (LHD-6) left, and the Royal Australian Navy amphibious ship HMAS Kanimbla (LPA-51), right during Rim of the Pacific (RIMPAC) 2010 exercises. 367k Republic of Korea Navy destroyer ROKS Sejong the Great (DDGH-991), left, is underway in formation with USS Bonhomme Richard (LHD-6) and the Ticonderoga-class guided-missile cruiser USS Chosin (CG-65) during Rim of the Pacific (RIMPAC) 2010. RIMPAC is a biennial, multinational exercise designed to strengthen regional partnerships and improve interoperability. 100724-N-1004S-351 PACIFIC OCEAN (July 24, 2010) 313k USS Bonhomme Richard (LHD-6), center, the guided-missile destroyer ROKS Sejong the Great (DDGH-991), left, the destroyer JMSDF Akebono (DD-108) and other ships assigned to the Rim of the Pacific (RIMPAC) 2010 combined task force transit the Pacific Ocean in a 32-vessel formation as part of a photo exercise north of Hawaii, on 24 July 2010. RIMPAC. 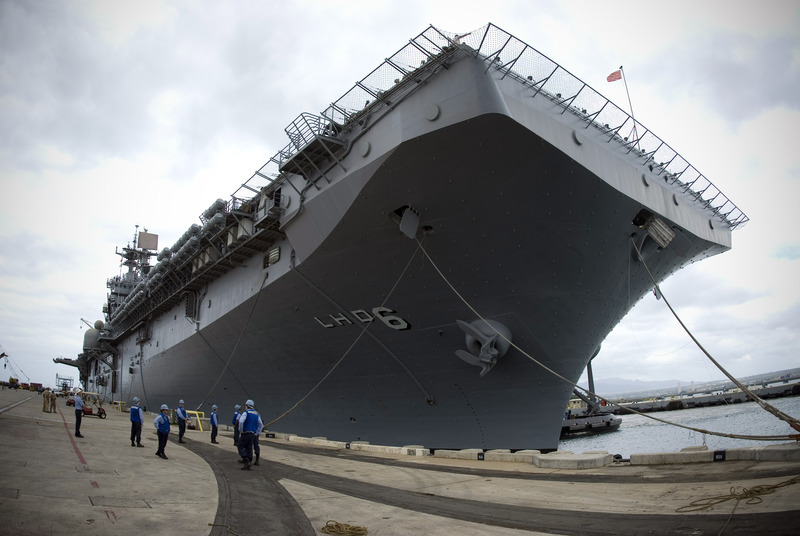 2096k USS Bonhomme Richard (LHD-6) returns to Joint Base Pearl Harbor-Hickam after participating in Rim of the Pacific (RIMPAC) 2010 exercises. RIMPAC is a biennial, multinational exercise designed to strengthen regional partnerships and improve multinational interoperability. 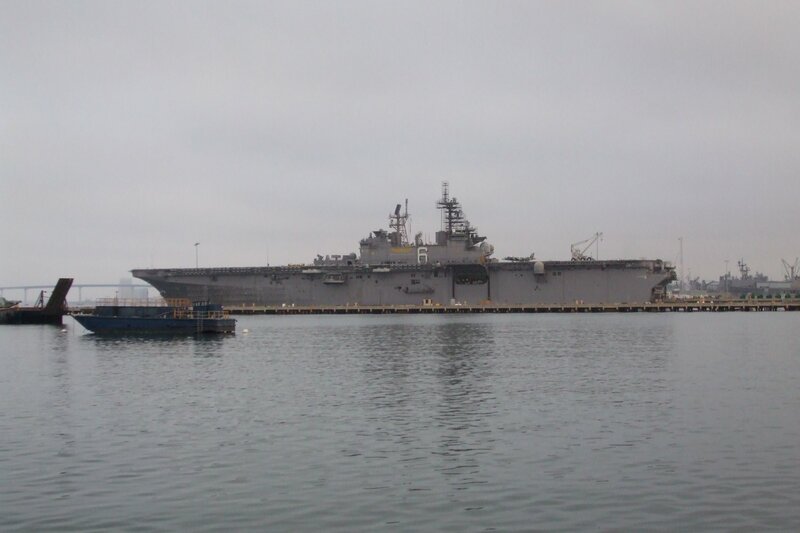 1577k USS Bonhomme Richard (LHD-6) moored at Pier 13 Naval Station San Diego while preparing for a dry dock planned maintenance availability period. 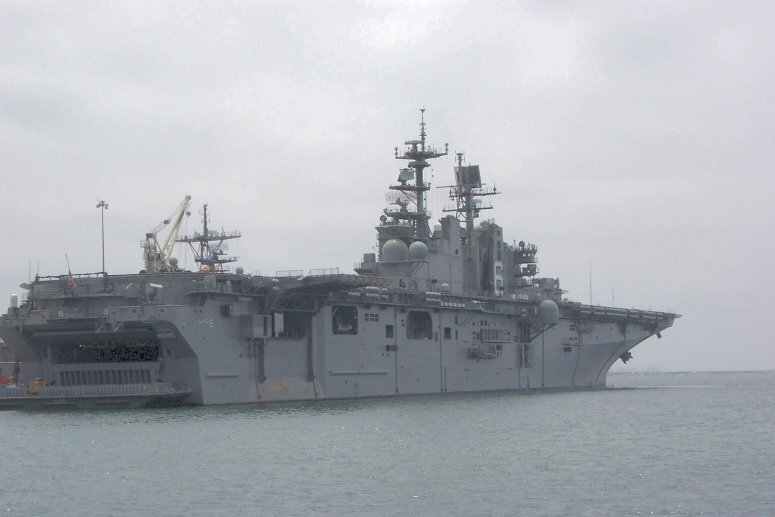 185k USS Makin Island (LHD-8) and USS Bonhomme Richard (LHD-6) at Naval Station San Diego, CA., September 2010 Richard Miller BMCS USNR Ret. 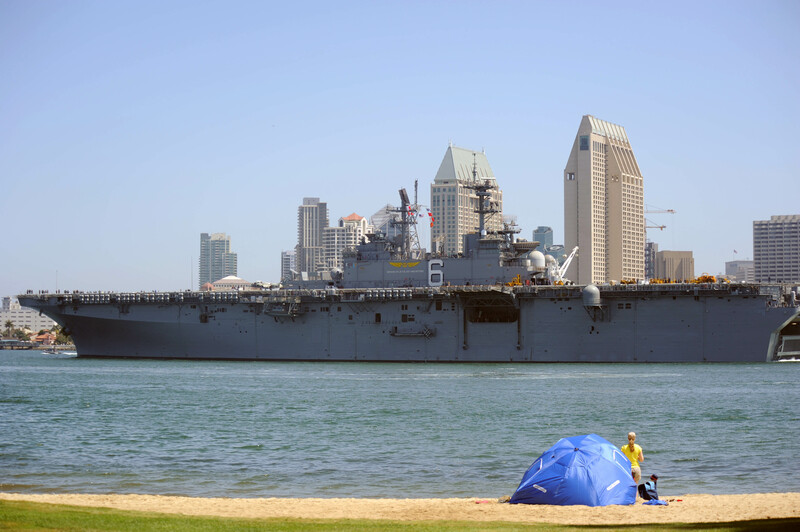 110708-N-PB383-001 1007k USS Bonhomme Richard (LHD-6) transits San Diego bay while out bound to sea for the first time in nearly 11 months. 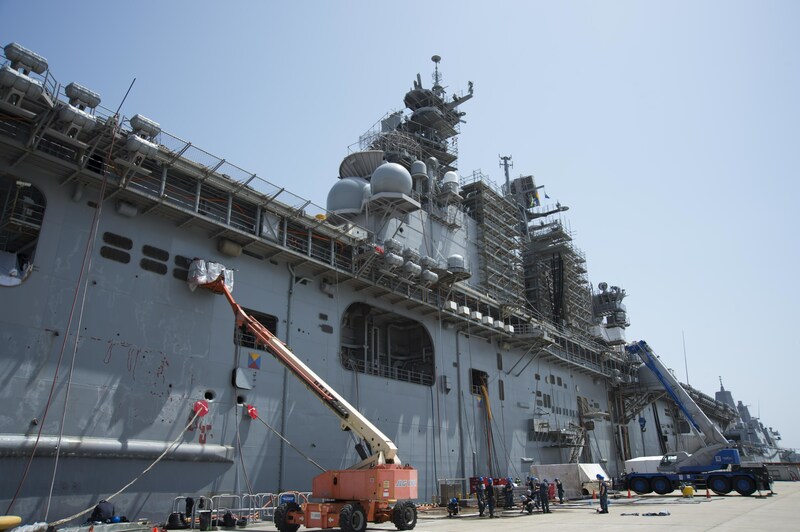 Bonhomme Richard completed a $100-million maintenance and dry-dock period, including modifications to support the Joint Strike Fighter and the MV-22 Osprey aircraft. 111005-N-QM098-002 533k USS Bonhomme Richard (LHD-6) passes under the Golden Gate Bridge and sails into San Francisco Bay, signaling the beginning of San Francisco Fleet Week 2011. 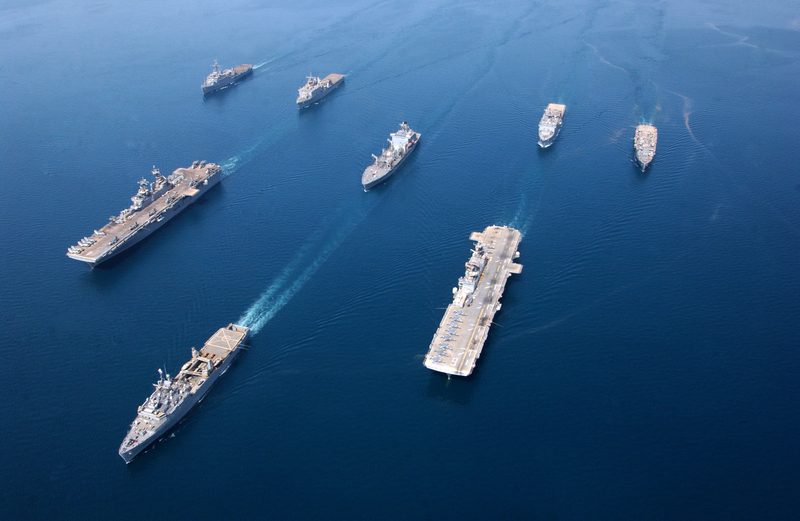 This year's event begins Saturday Oct. 8 with the Parade of Ships. 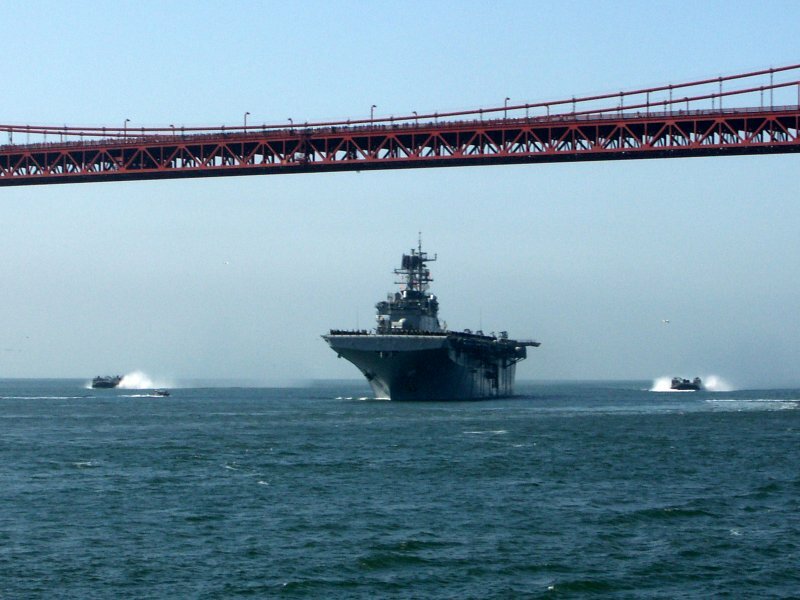 San Francisco Fleet Week is a five-day event that highlights the equipment, technology and operational capabilities of the military's sea services and their history in the San Francisco area. 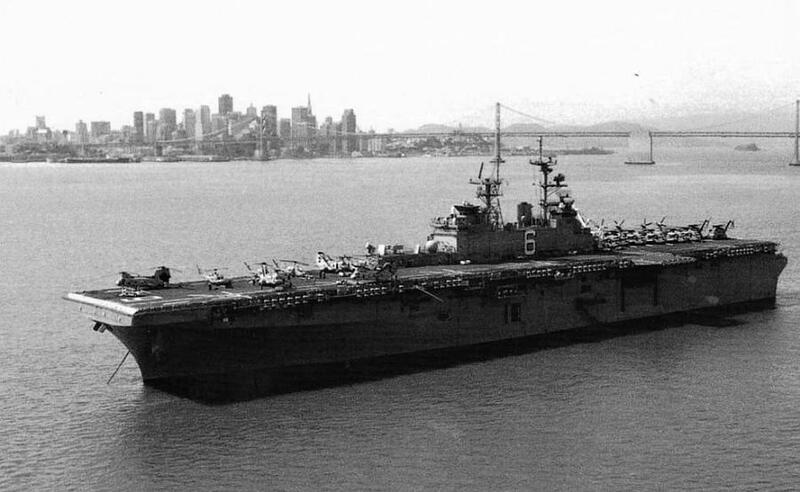 66k USS Bonhomme Richard (LHD-6) at anchor in San Francisco Bay, date unknown. 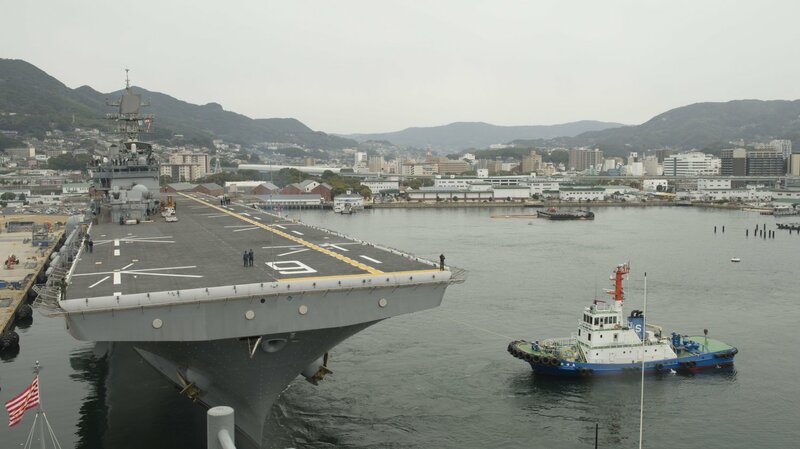 1021k USS Bonhomme Richard (LHD-6) anchors in Sasebo Harbor to load ammunition in preparation for patrol. 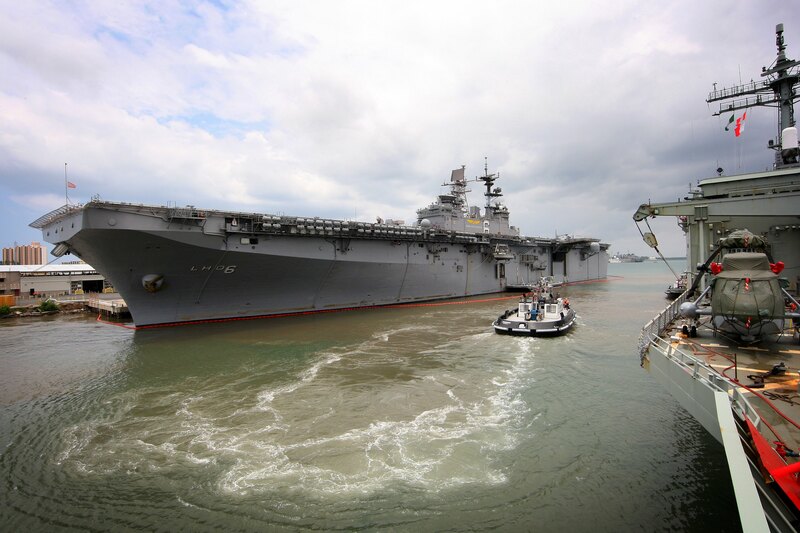 Bonhomme Richard is the lead ship of the only forward-deployed amphibious ready group. 12094-N-LM312-018 PHILIPPINE SEA (Sept. 24, 2012) 1995k USS Bonhomme Richard (LHD-6) prepares to pull alongside the Military Sealift Command fleet replenishment oiler USNS Tippecanoe (T-AO-199) during a replenishment at sea. 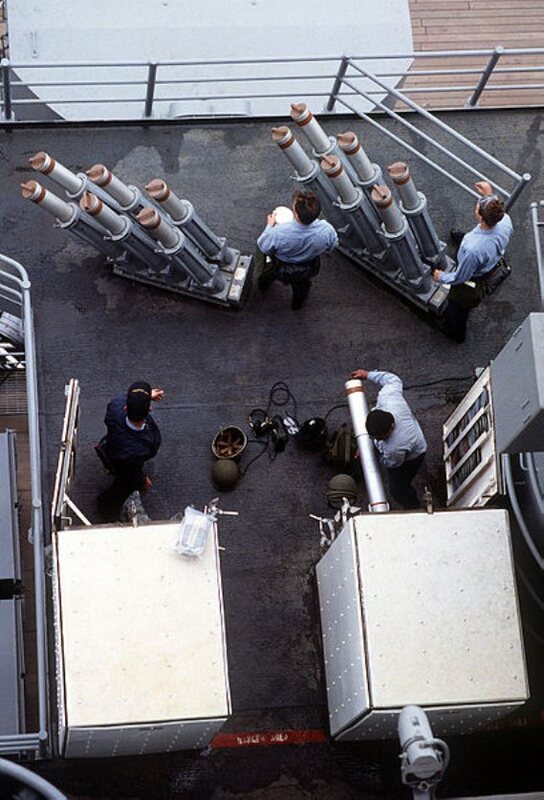 Note on the 01 level the 8-cell NATO Sea Sparrow Mk 29 launcher and a 21-cell Mk 49 Rolling Airframe Missile launcher, In the right corner of the photo are 12 Mk 36 Super Rapid Blooming Off-board Chaff mortars. On the flight deck: AV-8B Harriers, AH-1W Super Cobras, SH-60R Seahawk, CH-46E Sea Knights. 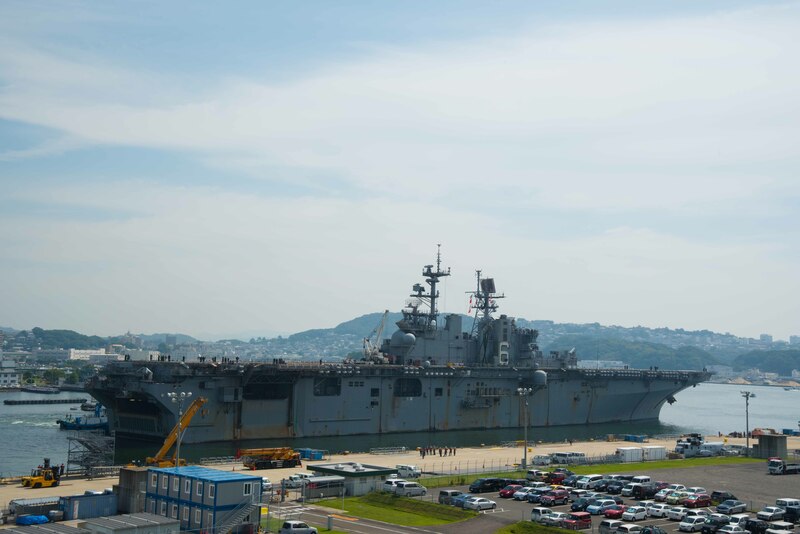 561k USS Bonhomme Richard (LHD-6) moored pierside at Naval Base Sasebo, Japan while the amphibious dock landing ship USS Tortuga (LSD-46) gets underway during a sea and anchor evolution. Tortuga is underway in preparation for an amphibious integration training and certification exercise and will participate in the annual multinational joint training exercise Cobra Gold. 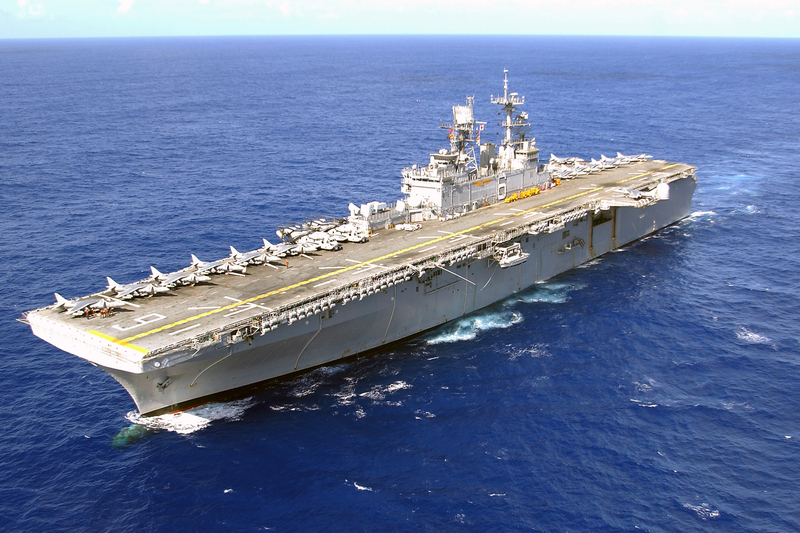 Tortuga is part of the Bonhomme Richard Amphibious Ready Group and is operating in the US 7th Fleet area of operation. 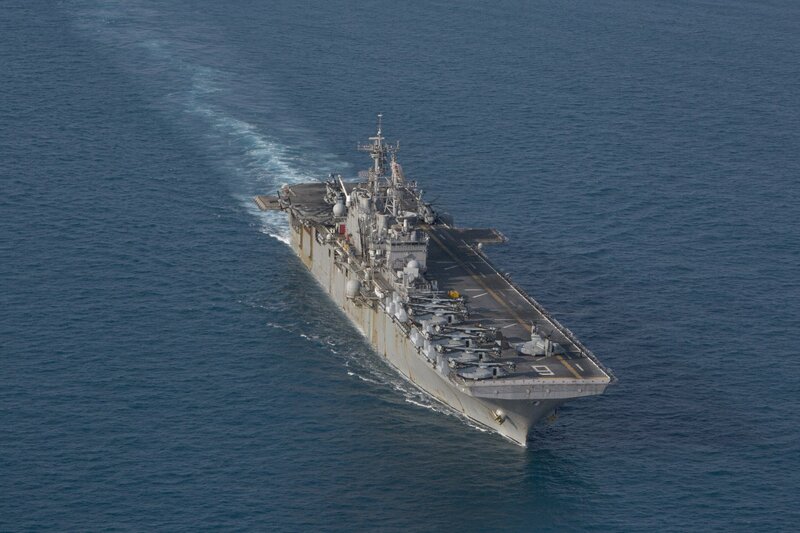 360k USS Bonhomme Richard (LHD-6) underway in the Coral Sea. Bonhomme Richard is the flagship of the Bonhomme Richard Amphibious Ready Group participating in exercise Talisman Saber 2013. Talisman Saber is a biennial exercise that enhances multilateral collaboration between U.S. and Australian forces for future combined operations, humanitarian assistance and natural disaster response. 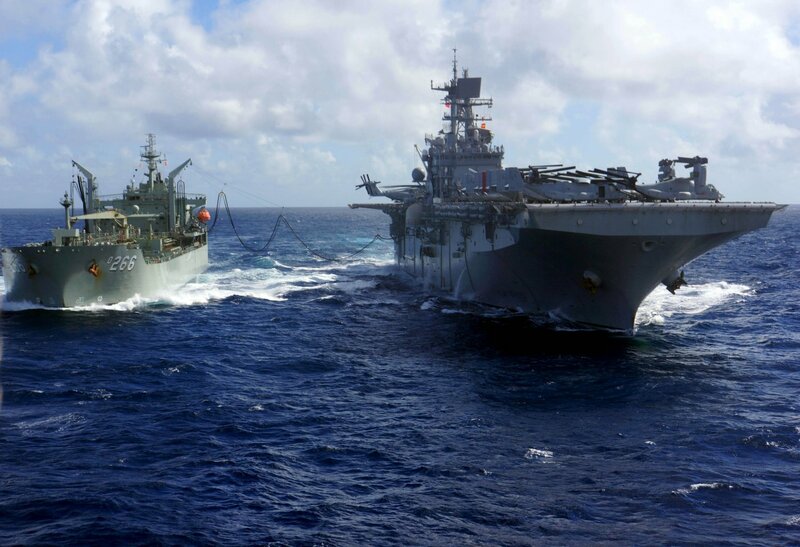 (July 18, 2013) 397k USS Bonhomme Richard (LHD-6) conducts a replenishment-at-sea with the Australian Navy replenishment tanker HMAS Sirius (O 266). 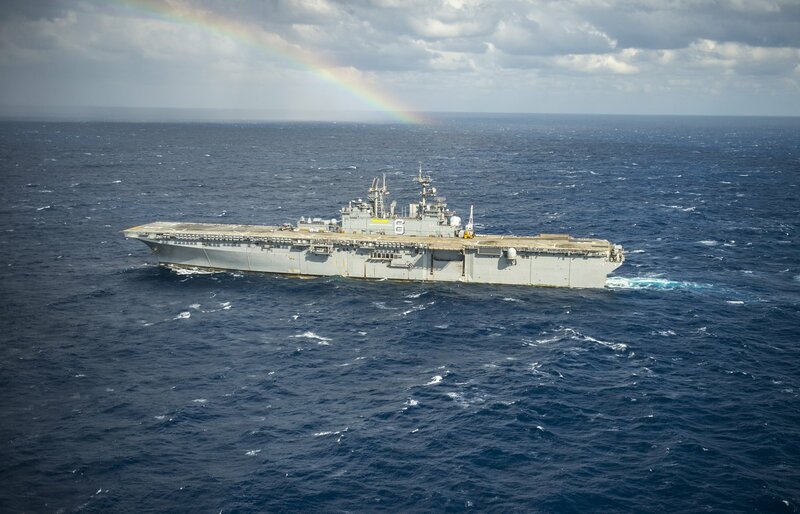 Bonhomme Richard is the flagship for the Bonhomme Richard Amphibious Ready Group and is participating in the biennial exercise Talisman Saber 2013 in the U.S. 7th Fleet area of responsibility. 140217-N-BB269-066 SASEBO, Japan (Feb. 17, 2014) 170k USS Bonhomme Richard (LHD-6) gets underway at Fleet Activities Sasebo. 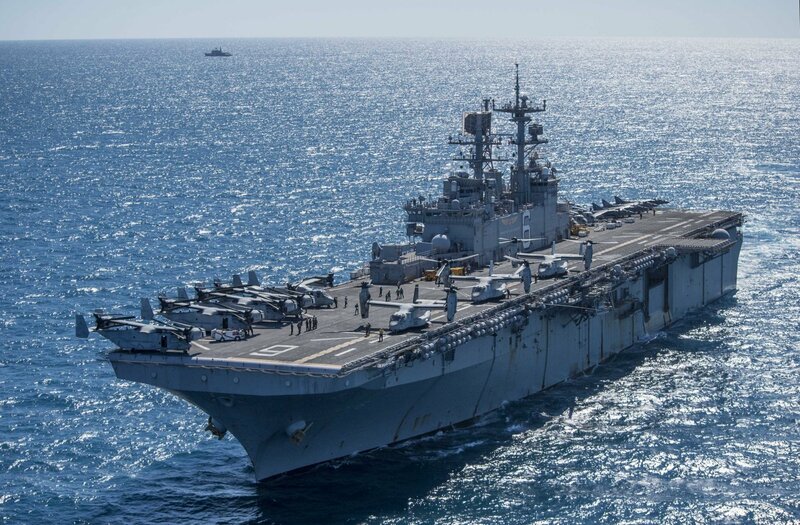 Bonhomme Richard is the flagship for the Bonhomme Richard Amphibious Ready Group and is conducting routine operations in the US 7th Fleet area of responsibility. 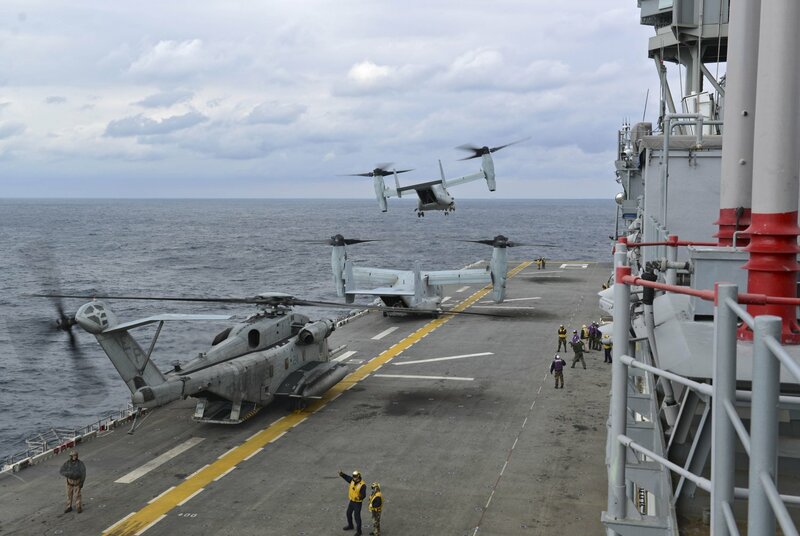 249k A second MV-22 Osprey tiltrotor aircraft assigned to the "Dragons" of Marine Medium Tiltrotor Squadron (VMM-265) prepares to land on the flight deck of USS Bonhomme Richard (LHD-6). 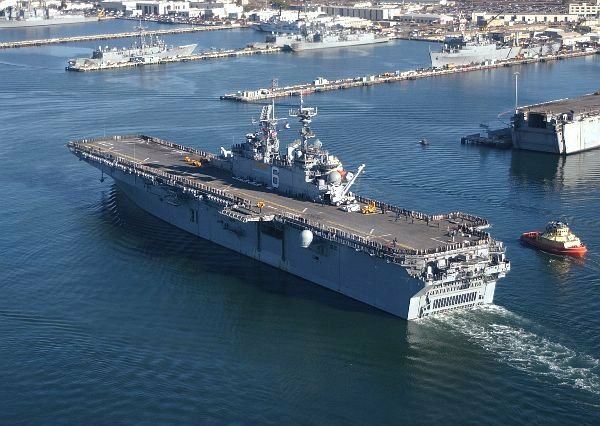 The Bonhomme Richard Amphibious Ready Group is conducting operations in the US. 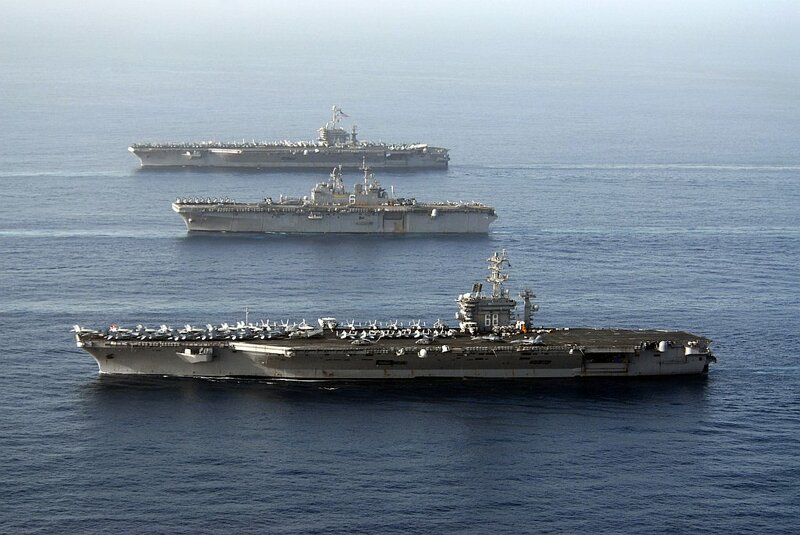 7th Fleet area of responsibility. 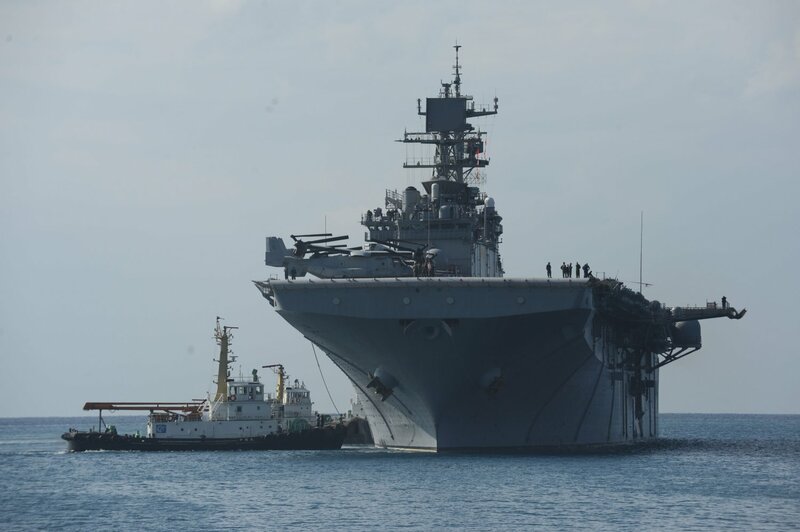 143k USS Bonhomme Richard (LHD-6) is assisted by tugs at White Beach. 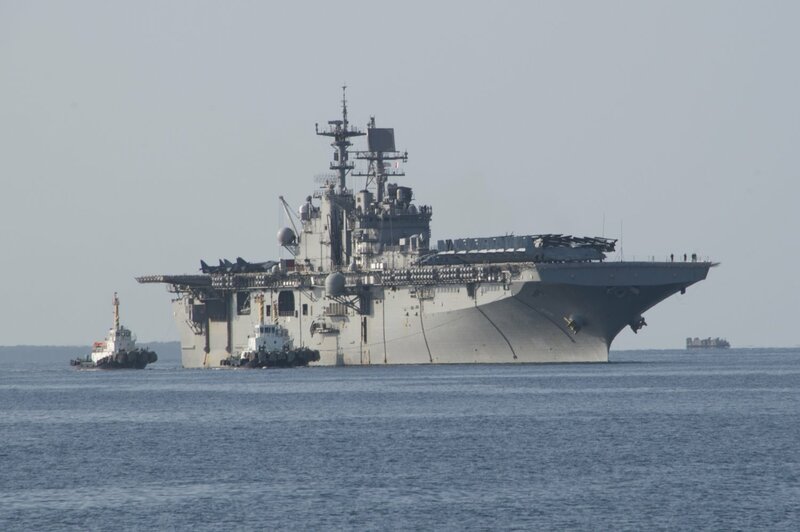 The Bonhomme Richard Amphibious Ready Group is conducting joint force operations in the U.S. 7th Fleet area of responsibility. 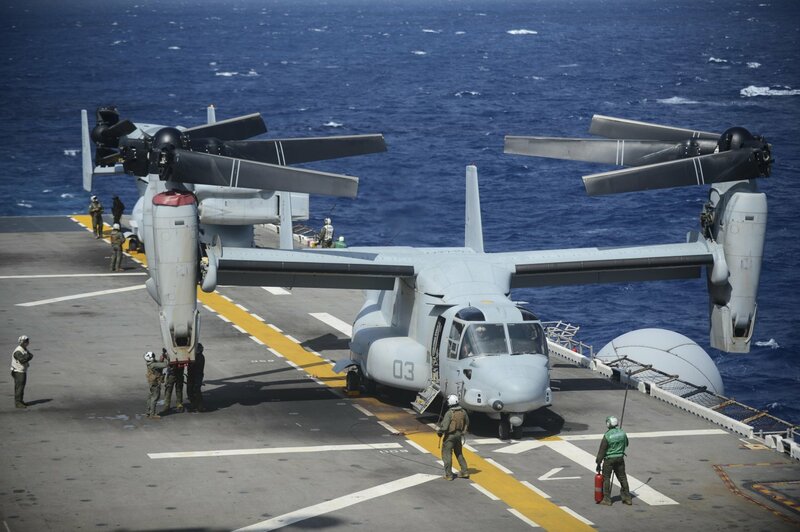 246k Sailors secure an MV-22 Osprey tiltrotor aircraft assigned to Marine Medium Tiltrotor Squadron (VMM-265) on the flight deck of USS Bonhomme Richard (LHD-6). 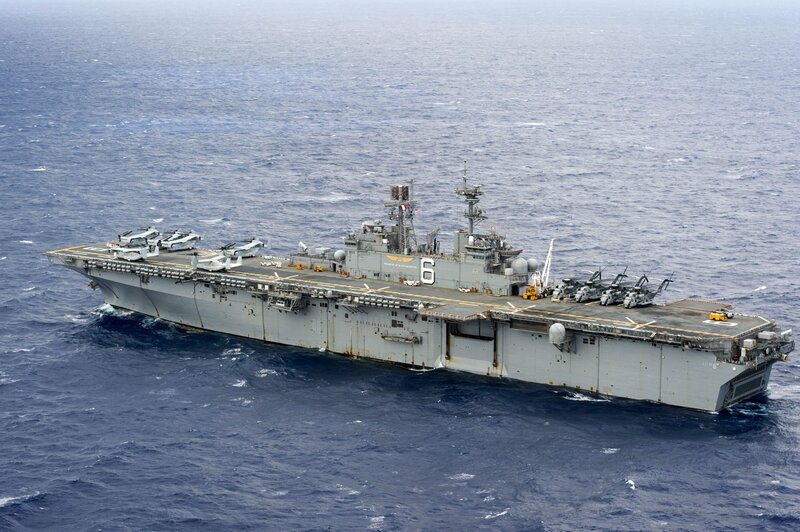 The Bonhomme Richard Amphibious Ready Group currently conducting joint force operations in the 7th Fleet area of responsibility. US Navy photo # 140327-N-BJ178-293 EAST CHINA SEA (March 27, 2014) by MC2 Michael Achterling. 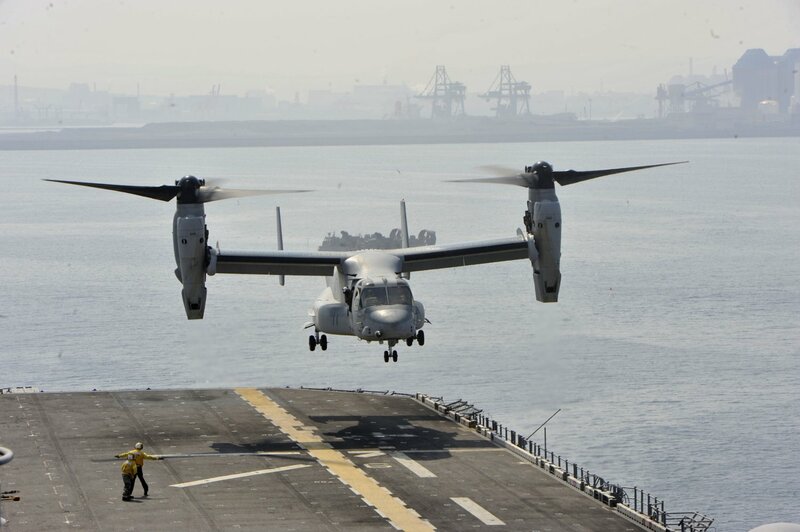 236k An MV-22 Osprey tiltrotor aircraft assigned to Marine Medium Tiltrotor Squadron (VMM-265) (Reinforced) takes off from the flight deck of USS Bonhomme Richard (LHD-6). 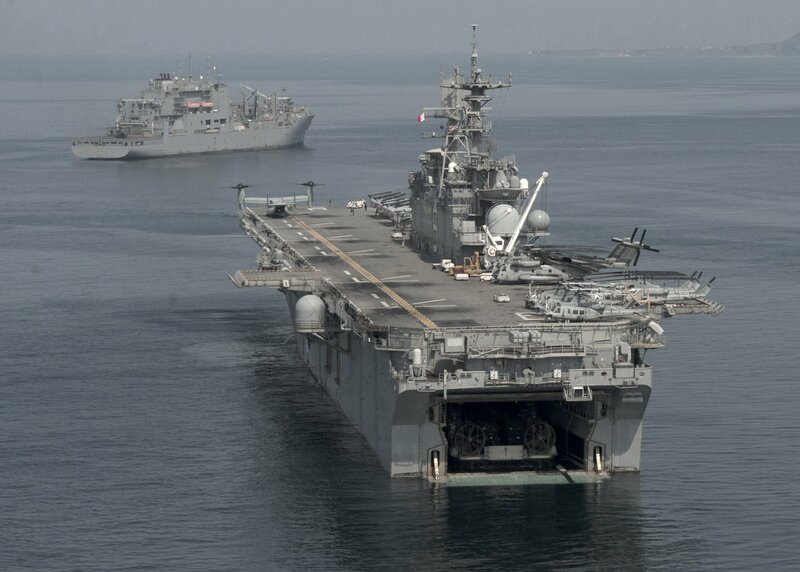 Bonhomme Richard is assigned to Expeditionary Strike Group Seven and is participating in Exercise Ssang Yong, an annual combined exercise conducted by U.S. Navy and Marine forces with the Republic of Korea. 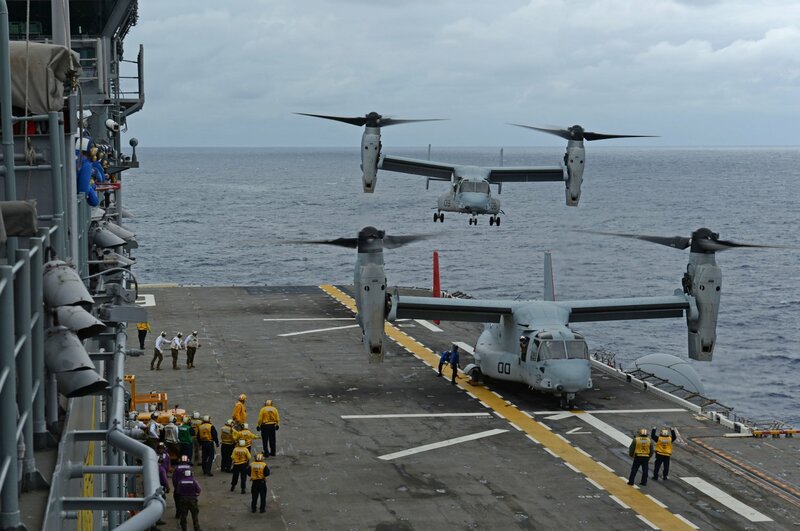 193k An MV-22 Osprey tiltrotor aircraft assigned to Marine Medium Tiltrotor Squadron (VMM-265) prepares to land on the flight deck of USS Bonhomme Richard (LHD-6). 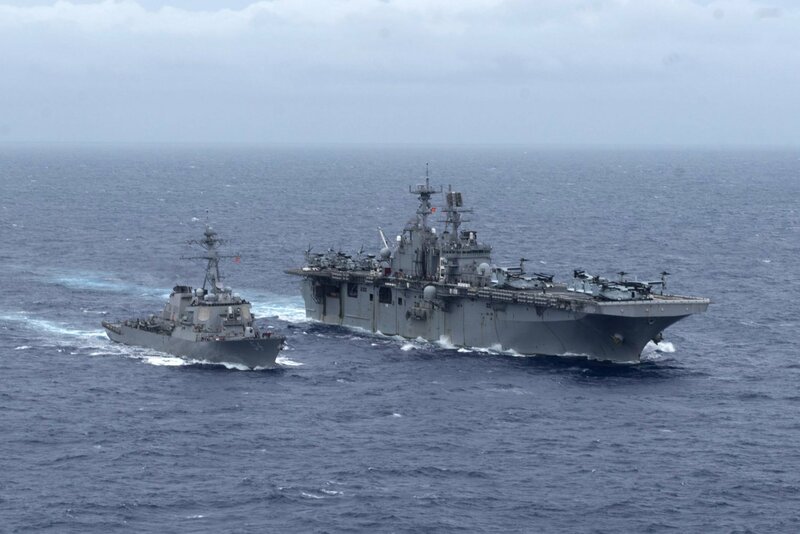 Bonhomme Richard is assigned to Expeditionary Strike Group (ESG) 7 and is participating in Exercise Ssang Yong, an annual combined exercise conducted by U.S. Navy and Marine forces with the Republic of Korea. 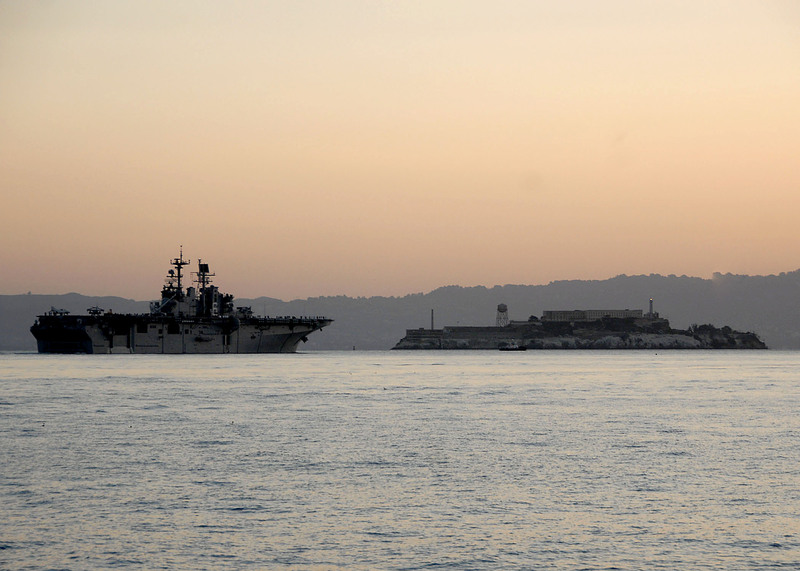 237k USS Bonhomme Richard (LHD-6), right, sits at anchor alongside the Military Sealift Command dry cargo and ammunition ship USNS Sacagawea (T-AKE-2). 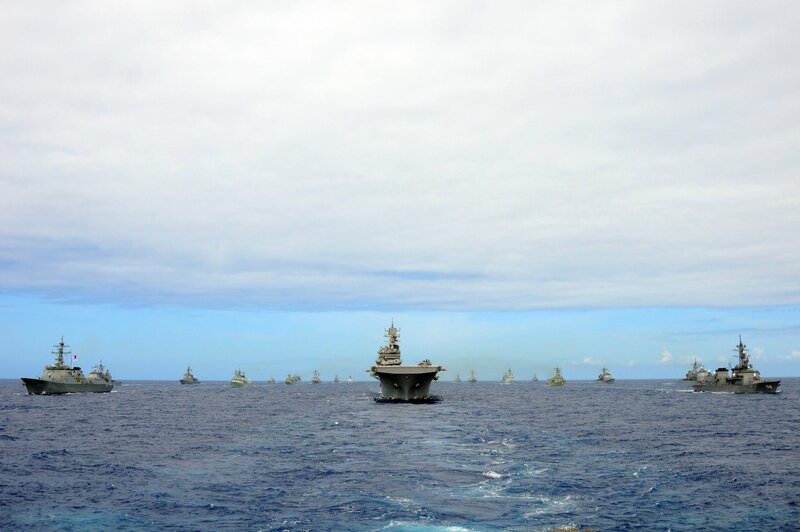 Bonhomme Richard is assigned to Expeditionary Strike Group (ESG-7) and is participating in exercise Ssang Yong, an annual combined exercise conducted by Navy and Marine forces with the Republic of Korea in order to strengthen interoperability across the range of military operations. 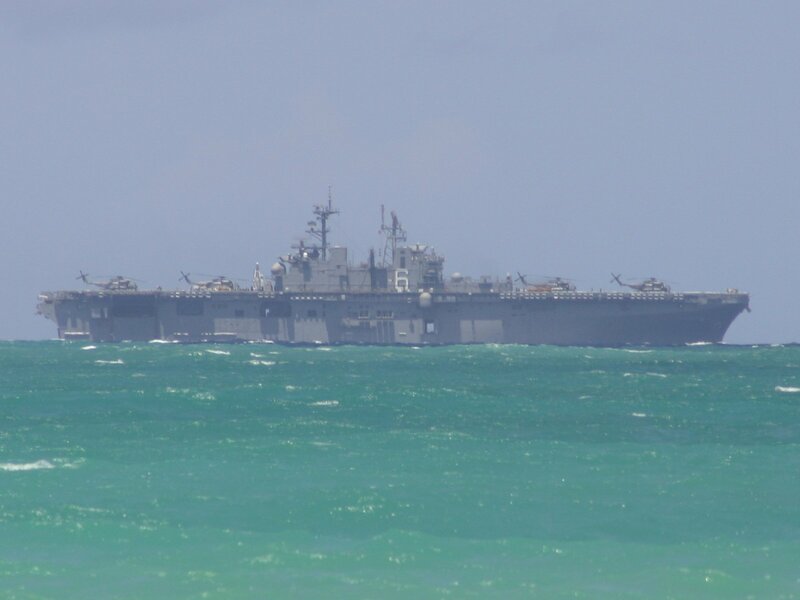 943k USS Bonhomme Richard (LHD 6) moored at White Beach, Okinawa while preparing to embark the 31st Marine Expeditionary Unit (31st MEU). 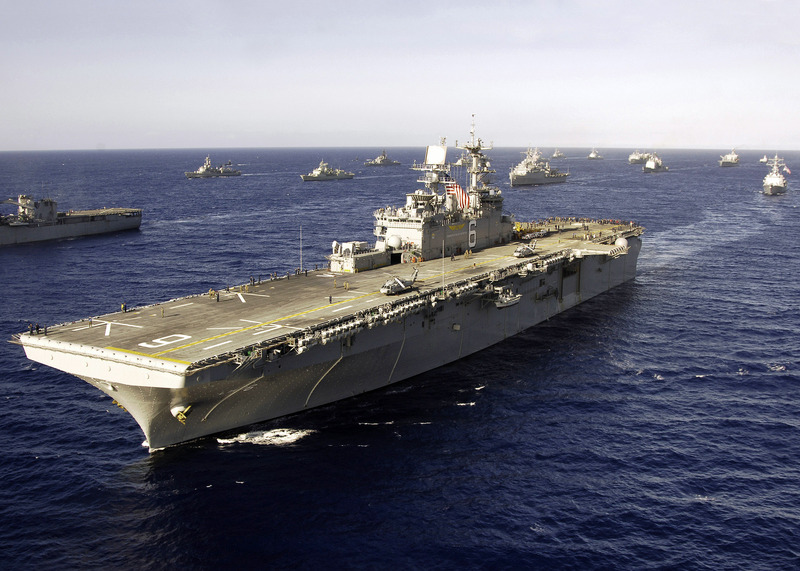 Bonhomme Richard is conducting operations in the U.S. 7th Fleet area of responsibility. 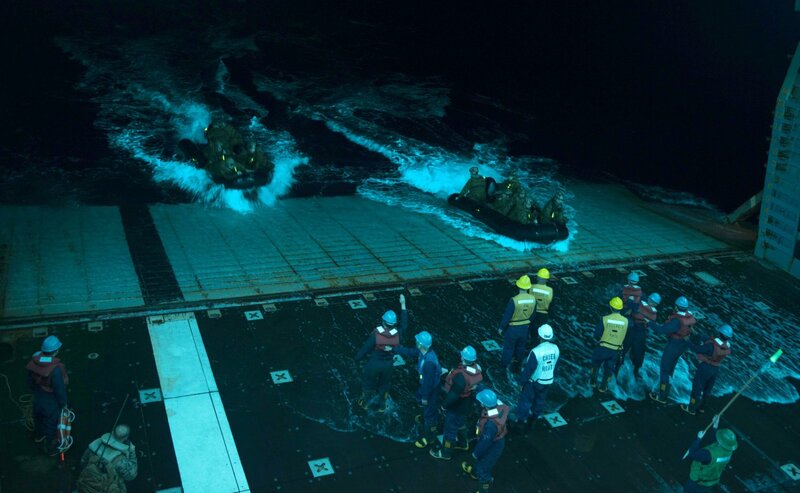 214k Sailors recover combat rubber raiding craft with Marines assigned to the 31st Marine Expeditionary Unit (31st MEU) during night operations in the well deck of USS Bonhomme Richard (LHD-6). 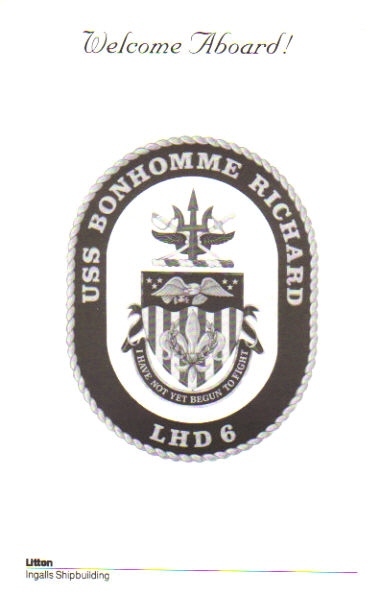 Bonhomme Richard is deployed in the U.S. 7th Fleet area of responsibility. 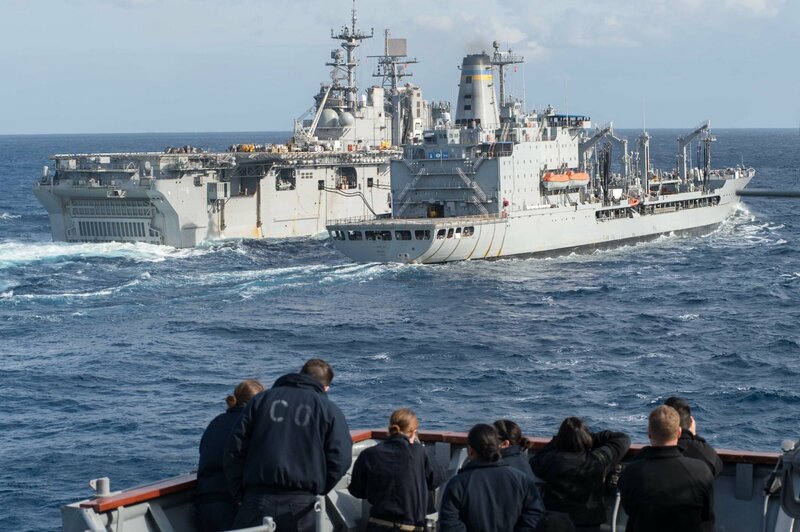 311k The Whidbey Island-class amphibious dock landing ship USS Ashland (LSD-48) prepares to come alongside USNS Pecos (T-AO-197) for a replenishment-at-sea as Pecos replenishes USS Bonhomme Richard (LHD-6). 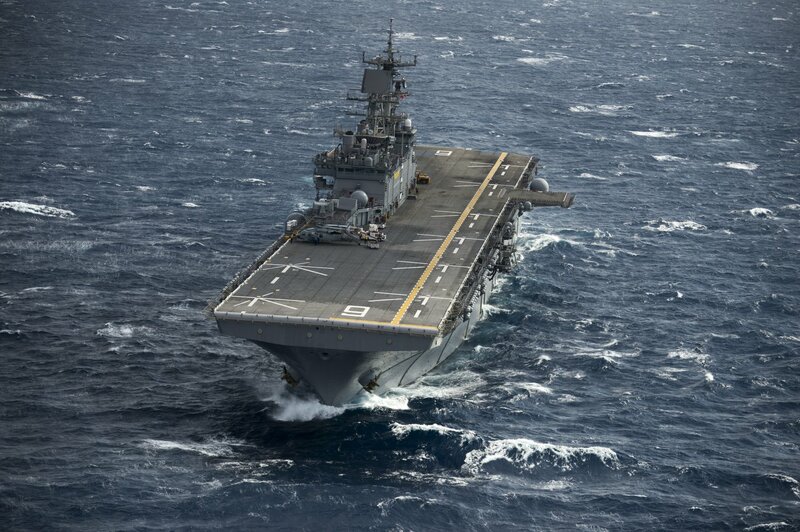 Ashland is part of the Bonhomme Richard Amphibious Ready Group and, with the embarked 31st Marine Expeditionary Unit (31st MEU), is conducting an amphibious integration training exercise. 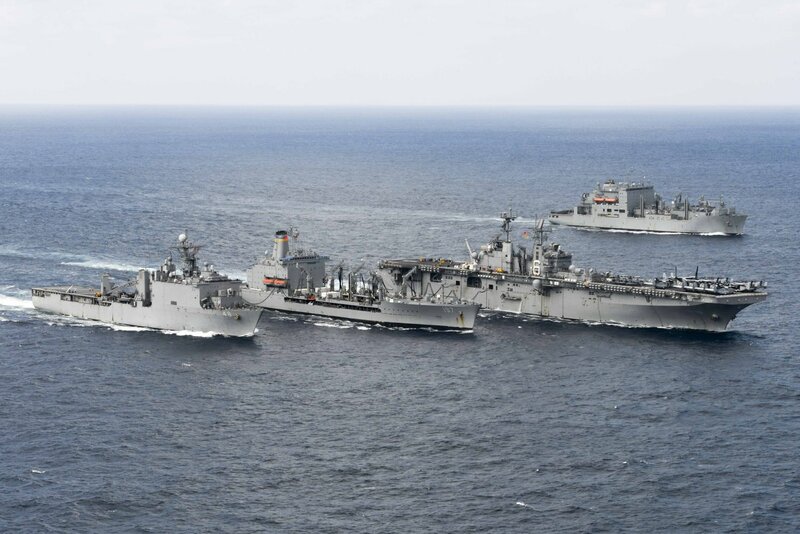 293k The Whidbey Island-class amphibious dock landing ship USS Ashland (LSD-48) and the amphibious assault ship USS Bonhomme Richard (LHD-6) participate in a replenishment-at-sea with the Military Sealift Command fleet replenishment oiler USNS Pecos (T-AO-197). 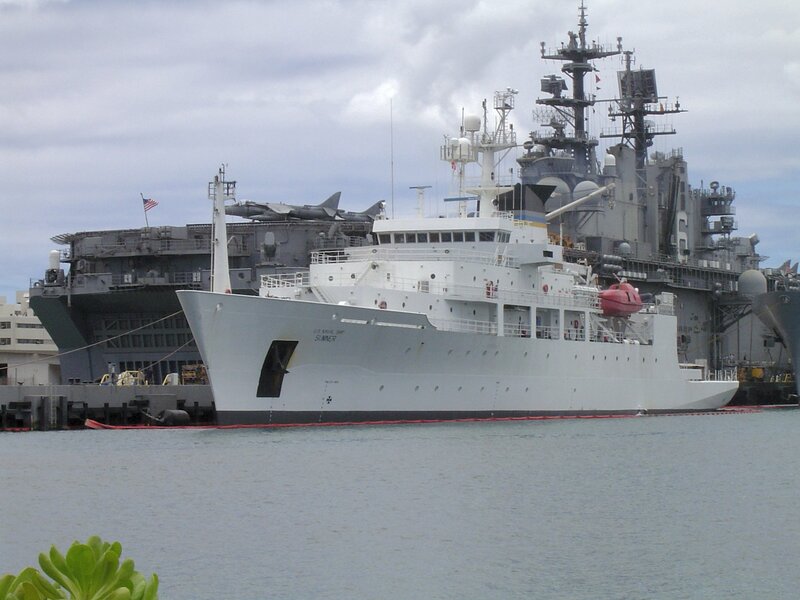 Also in the photo is USNS Washington Chambers (T-AKE-11). 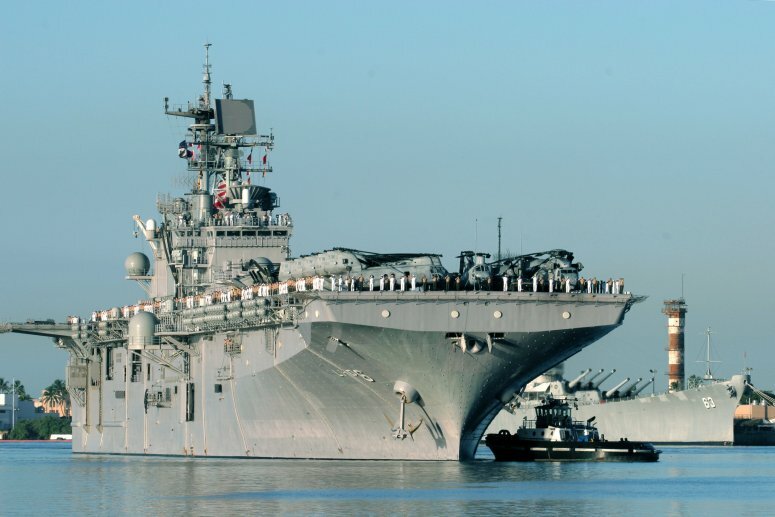 Bonhomme Richard and Ashland are a part of the Bonhomme Richard Amphibious Ready Group are conducting an amphibious integration training exercise. 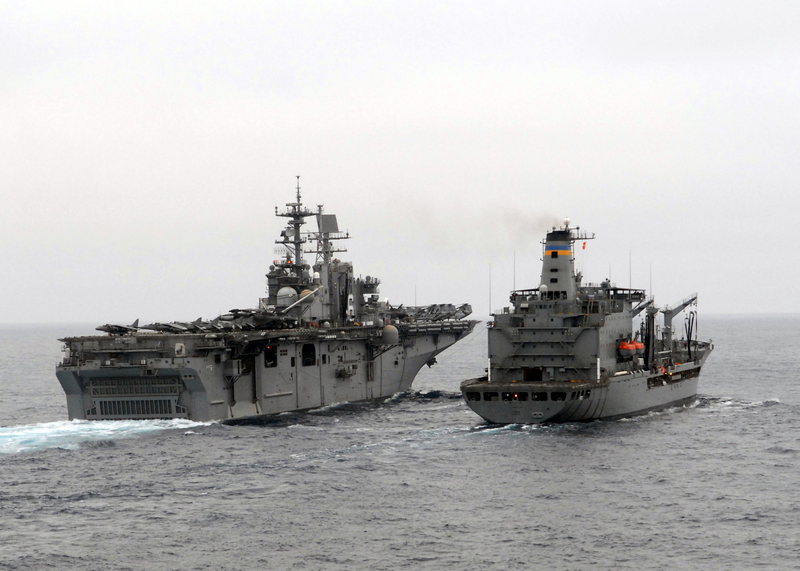 150605-N-NP779-043 EAST CHINA SEA (June 5, 2015) 845k USS Bonhomme Richard (LHD 6) and the amphibious dock landing ship USS Ashland (LSD-48) maneuver to conduct a replenishment-at-sea. 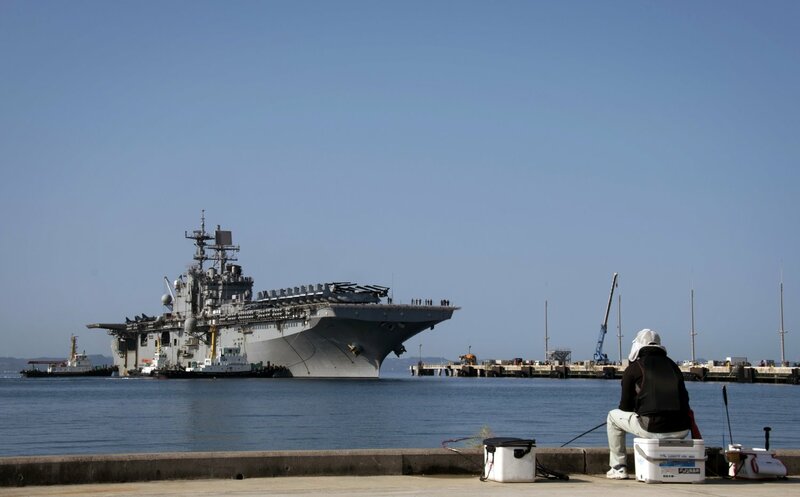 Bonhomme Richard, the lead ship of the Bonhomme Richard Amphibious Ready Group, is assigned to the U.S. 7th Fleet area of operations supporting security and stability in the Indo-Asia-Pacific region. 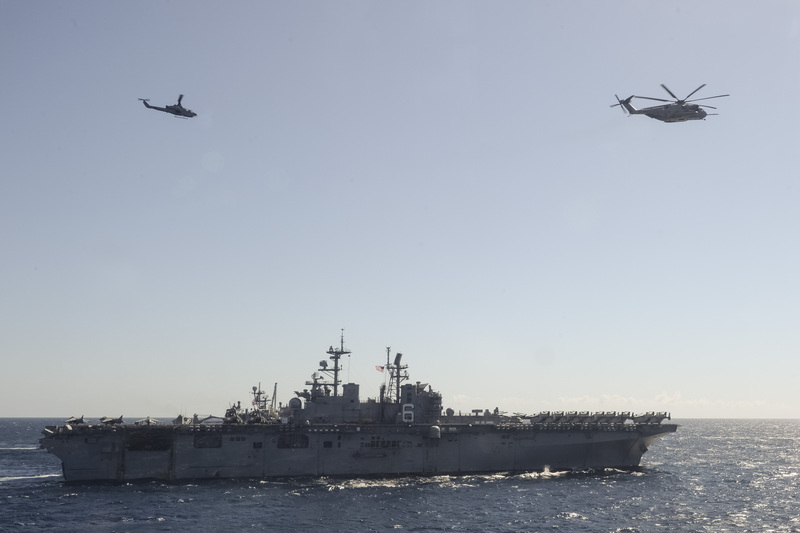 934k An AH-1W Super Cobra helicopter, left, and a CH-E Super Stallion attached to the 31st Marine Expeditionary Unit (31st MEU) fly over USS Bonhomme Richard (LHD-6). 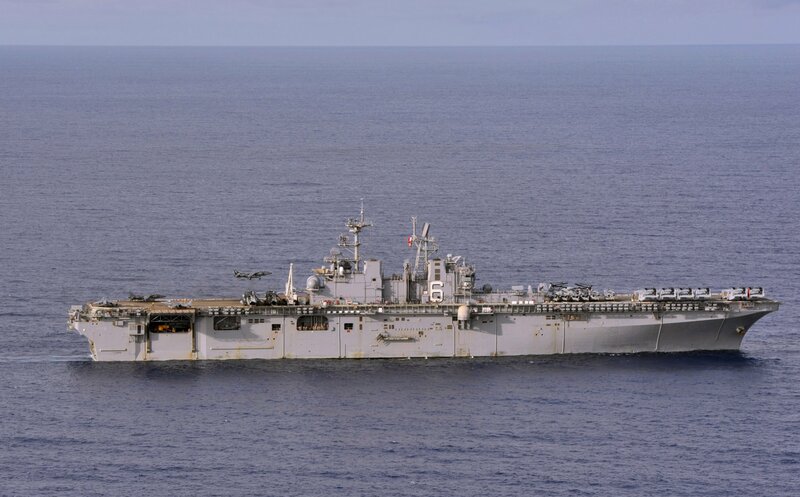 Bonhomme Richard is the lead ship of the Bonhomme Richard Expeditionary Strike Group and is on patrol in the U.S. 7th Fleet area of operations. 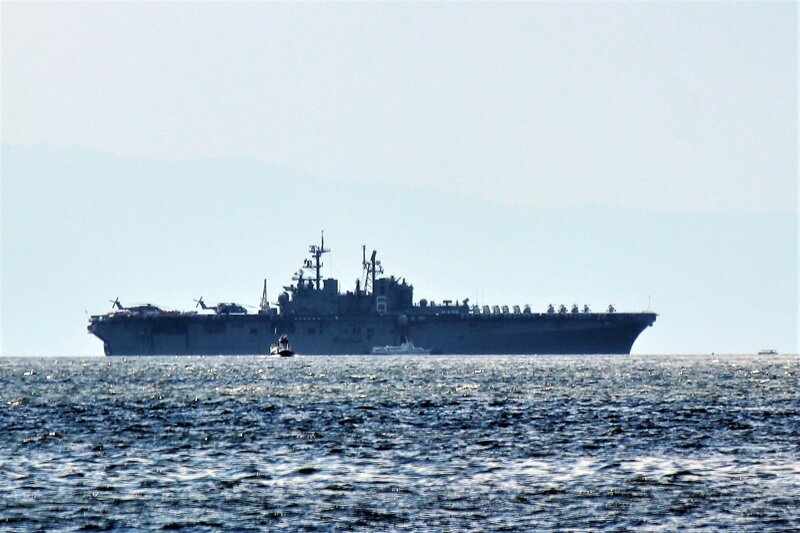 1373k USS Bonhomme Richard (LHD-6) transits the Pacific Ocean. 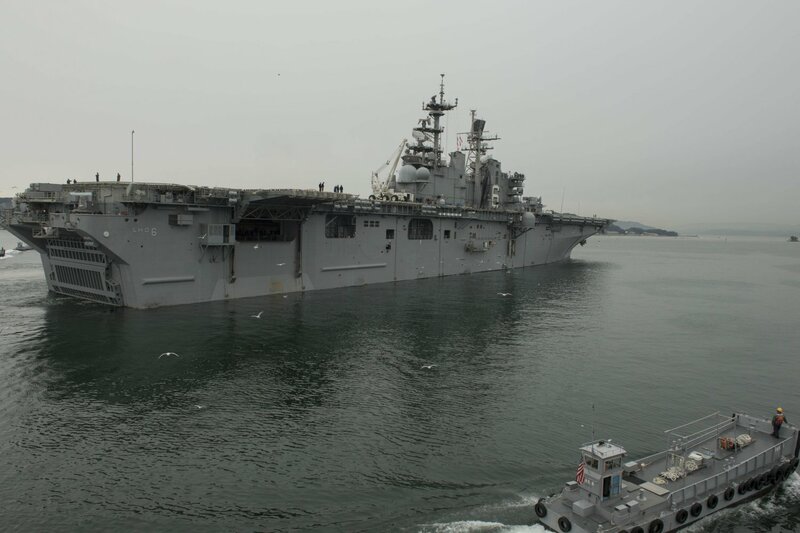 Bonhomme Richard is the lead ship of the forward deployed Bonhomme Richard Expeditionary Strike Group and is on patrol in the U.S. 7th Fleet area of operations. 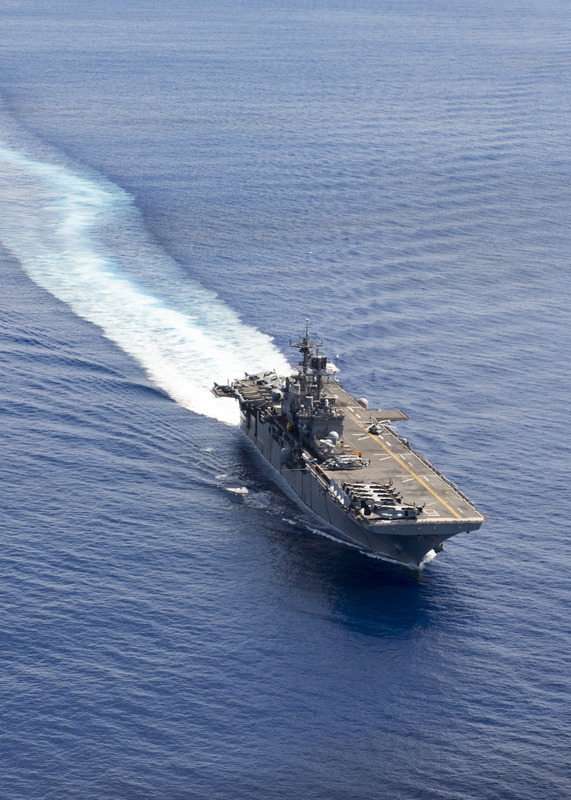 1268k The forward deployed USS Bonhomme Richard (LHD-6) transits the Pacific Ocean. 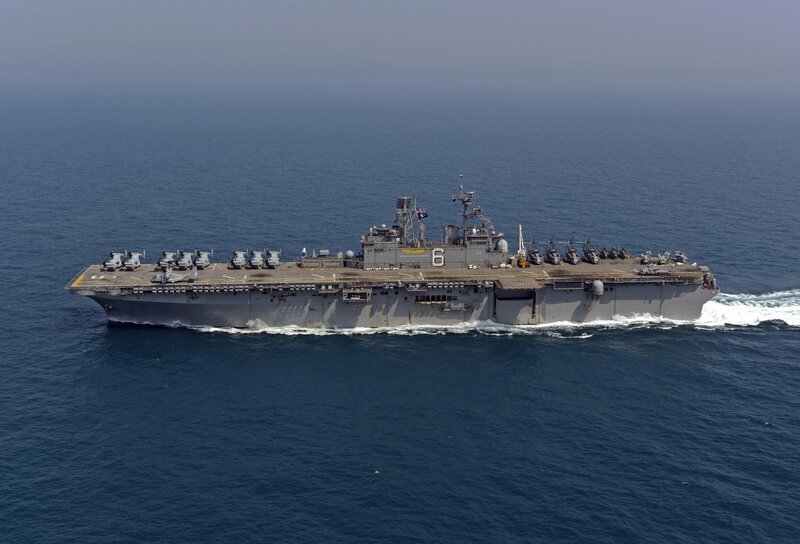 Bonhomme Richard is the lead ship of the Bonhomme Richard Expeditionary Strike Group and is on patrol in the U.S. 7th Fleet area of operations. 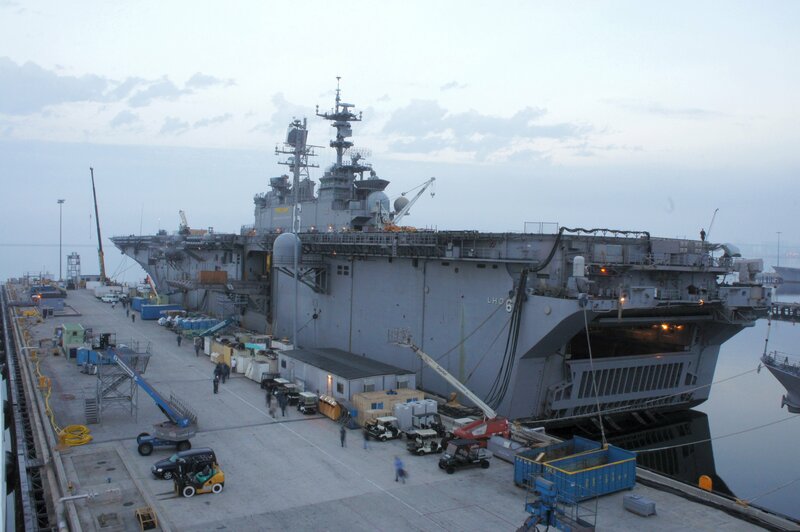 1186k USS Bonhomme Richard (LHD-6) conducts maintenance during a ship�s restricted availability (SRA) period in Sasebo. 367k USS Bonhomme Richard (LHD-6) transits the East China Sea. 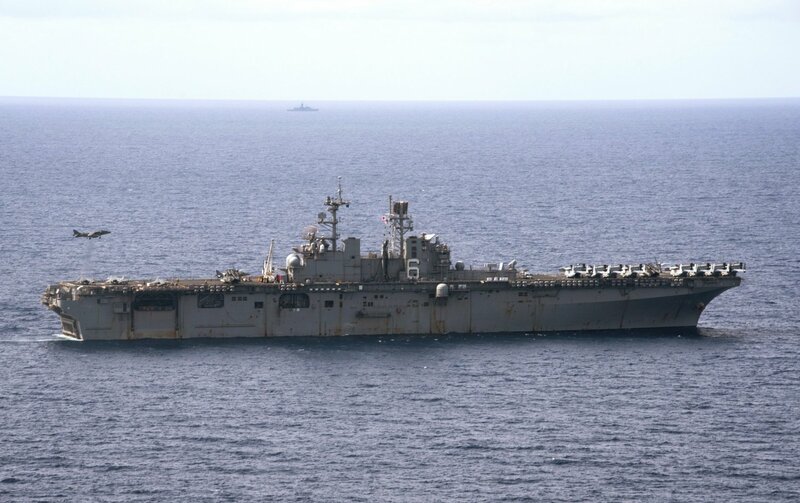 Bonhomme Richard, flagship of the Bonhomme Richard Expeditionary Strike Group, is operating in the U.S. 7th Fleet area of operations in support of security and stability in the Indo-Asia-Pacific region. 164k A Navy MH-60S Seahawk from USS Bonhomme Richard (LHD-6) delivers supplies during a replenishment at sea with USS Green Bay (LPD-20). 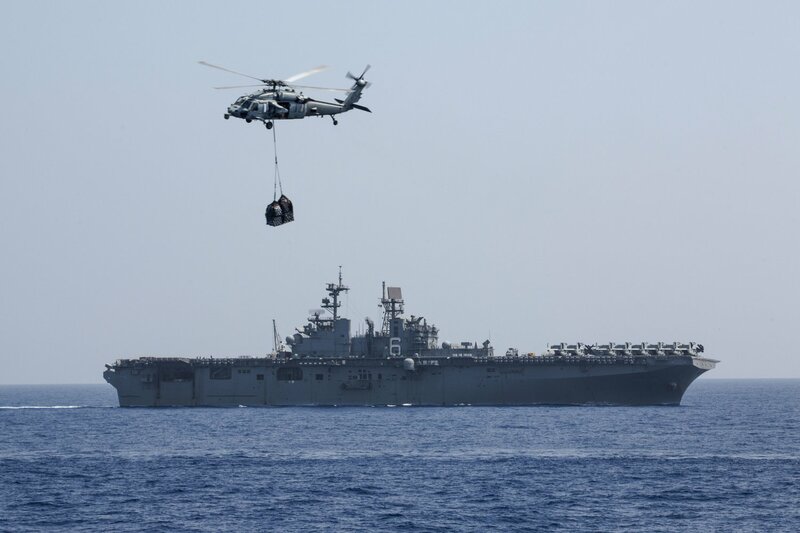 Helicopters from Bonhomme Richard carried supplies from USNS Charles Drew (T-AKE-10) to ships of the Bonhomme Richard Expeditionary Strike Group as a prerequisite for pre-deployment certification during Amphibious Integration Training between the ships of the Bonhomme Richard Expeditionary Strike Group and the 31st MEU. 207k The Arleigh Burke-class guided missile destroyer USS Curtis Wilber (DDG-54) steams alongside USS Bonhomme Richard (LHD-6) prior to a fueling at sea (FAS). 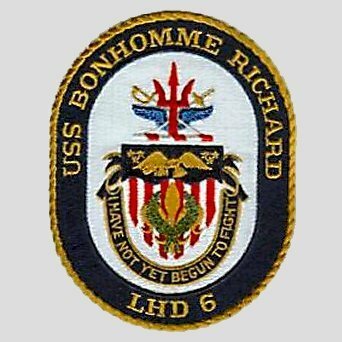 Bonhomme Richard, flagship of the Bonhomme Richard Expeditionary Strike Group, is operating in the Philippine Sea in support of security and stability in the Indo-Asia Pacific region. USNS Walter S. Diehl (T-AO-193) during a photo exercise to signify the completion of Valiant Shield 2016. Valiant Shield is a biennial, U.S.-only, field-training exercise with a focus on integration of joint training among U.S. forces. This was the sixth exercise in the series, that began in 2006. 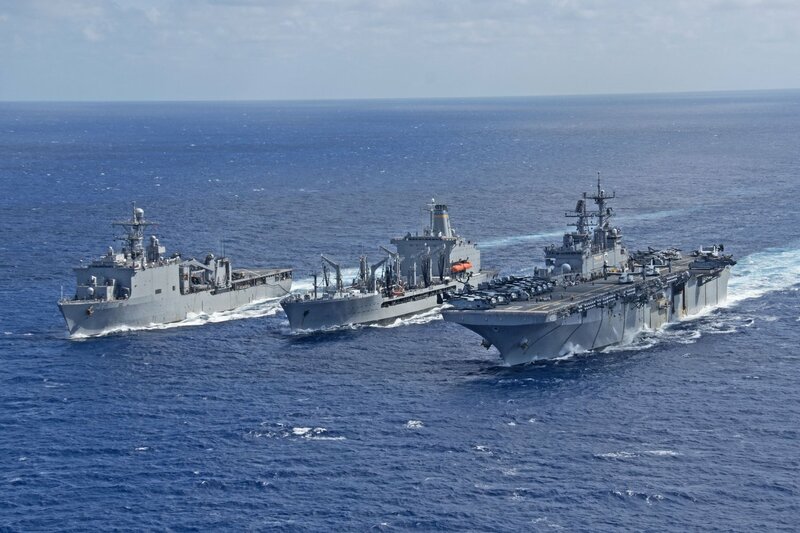 221k USS Bonhomme Richard (LHD-6), middle, conducts a replenishment-at-sea with the Military Sealift Command dry cargo and ammunition ship USNS Washington Chambers (T-AKE-11), right, and the fleet replenishment oiler USNS Walter S. Diehl (T-AO-193) in the South China Sea. 208k USS Bonhomme Richard (LHD-6) passes the Japan Maritime Self-Defense Force destroyer JS Kongo (DDG-173) as she departs Sasebo, Japan. 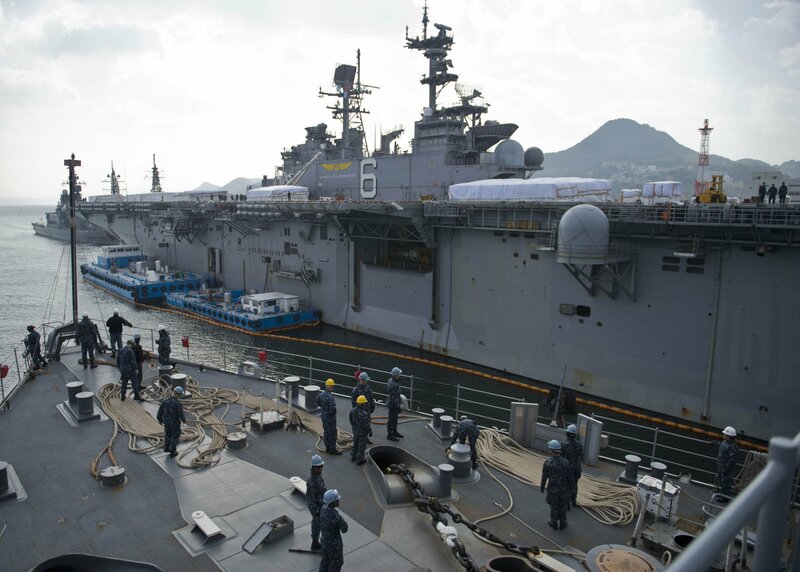 Bonhomme Richard, forward-deployed to Sasebo, Japan, is serving forward to provide a rapid-response capability in the event of a regional contingency or natural disaster. 154k An AV-8B Harrier II, assigned to the "Tomcats" of Marine Attack Squadron (VMA) 311, lands aboard USS Bonhomme Richard (LHD-6). The ship is conducting unit-level training to ensure warfighting readiness in preparation for a routine patrol in support of security and stability in the Indo-Asia Pacific region. OKINAWA, Japan (March 4, 2017) 150k USS Bonhomme Richard (LHD-6) arrives at White Beach Naval Facility for a port visit. The ship is on a routine patrol, operating in the Indo-Asia-Pacific region to serve as a forward-capability for any type of contingency. 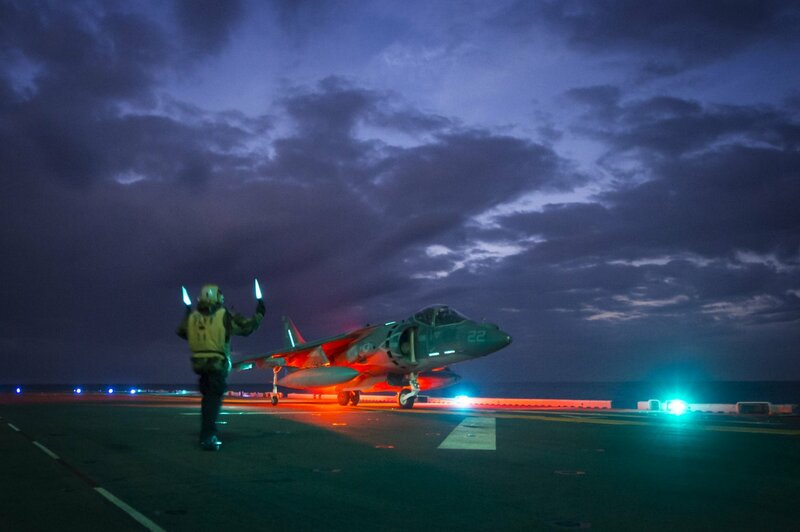 271k An AV-8B Harrier assigned to the Marine Attack Squadron (VMA) 311, lands aboard USS Bonhomme Richard (LHD-6) during Talisman Saber 17. 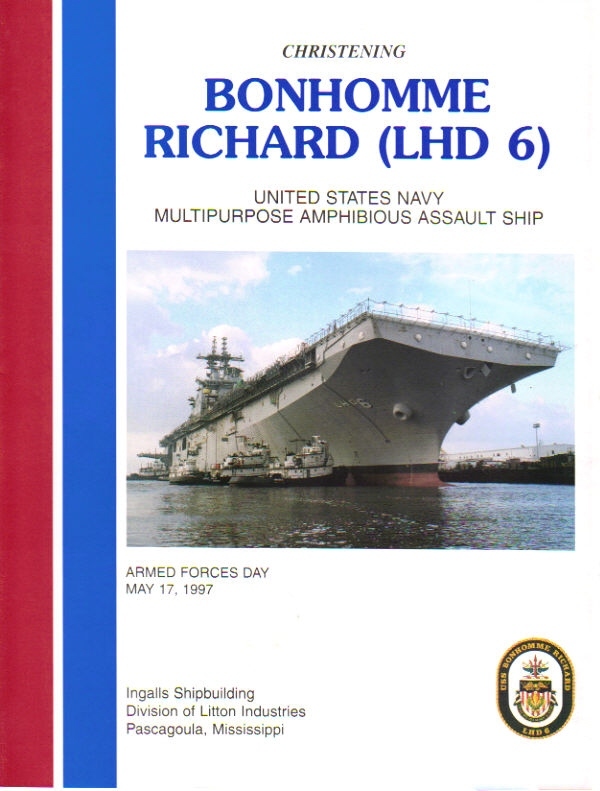 Bonhomme Richard is part of a combined U.S.-Australia-New Zealand expeditionary strike group, which is undergoing a series of scenarios that will increase naval proficiencies in operating against blue-water adversarial threats and in its primary mission of launching Marine forces ashore in the littorals. Talisman Saber is a biennial U.S.-Australia bilateral exercise held off the coast of Australia meant to achieve interoperability and strengthen the U.S.-Australia alliance. US Navy photo # 170710-N-YG104-010 CORAL SEA (July 10, 2017) 306k USS Bonhomme Richard (LHD-6), right, steams alongside USNS John Ericsson (T-AO-194) and the amphibious dock landing ship USS Ashland (LSD-48) during a replenishment-at-sea during Talisman Saber 2017. 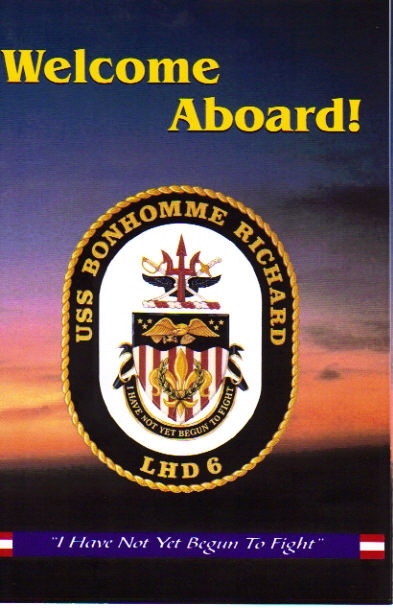 Bonhomme Richard is part of a combined U.S., Australia and New Zealand expeditionary strike group and is undergoing a series of scenarios that will increase naval proficiencies in operating against blue-water adversarial threats and in its primary mission of launching Marine forces ashore in the littorals. 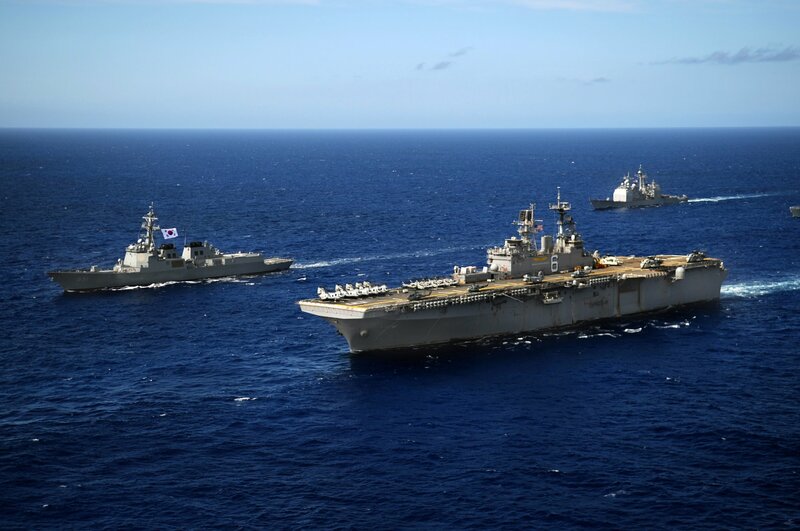 Talisman Saber is a biennial U.S.-Australia bilateral exercise held off the coast of Australia, meant to achieve interoperability and strengthen the U.S.-Australia alliance. 464k USS Bonhomme Richard (LHD-6) approaches the Royal Australian Navy hydrographic ship HMAS Melville (A 246) as they prepare to support recovery operations on the downed MV-22 Osprey aircraft that crashed 5 August 2017. 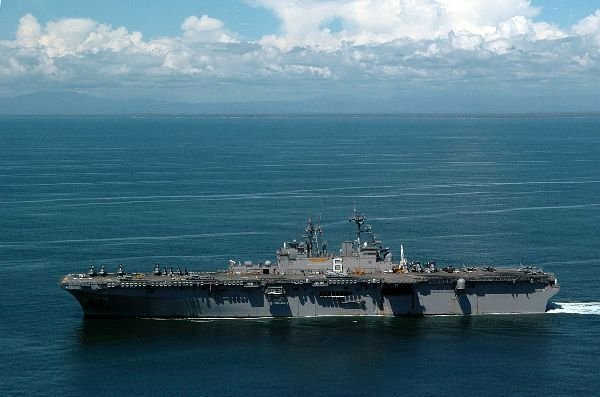 287k USS Bonhomme Richard (LHD-6) transits the Shoalwater Bay Training Area in Queensland, Australia, 23 August 2017. 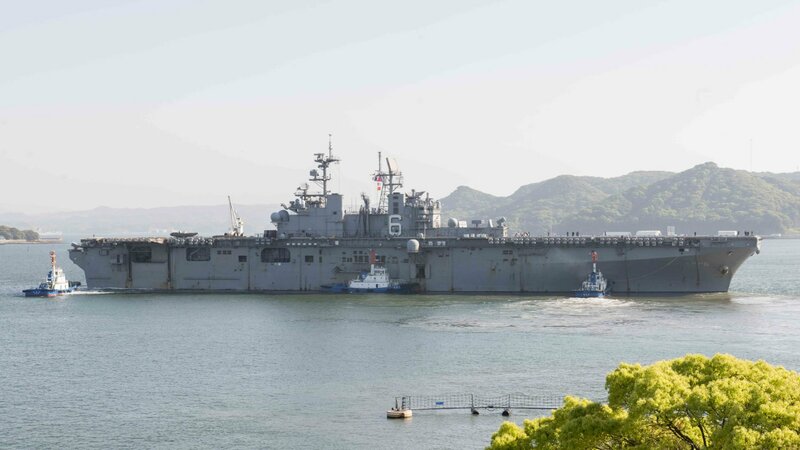 840k USS Bonhomme Richard (LHD-6) returned to Sasebo following a four-month deployment in the Indo-Asia-Pacific Region. 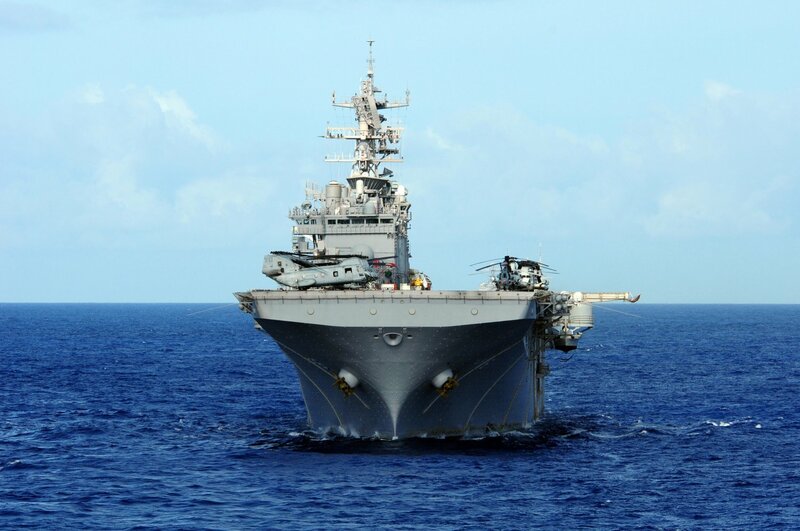 Bonhomme Richard served as the flagship of the Bonhomme Richard Expeditionary Strike Group during the deployment, which was highlighted by the U.S.-Australian bilateral exercise Talisman Saber and several port visits in Australia resulting in enhanced interoperability and relations between the two allies. 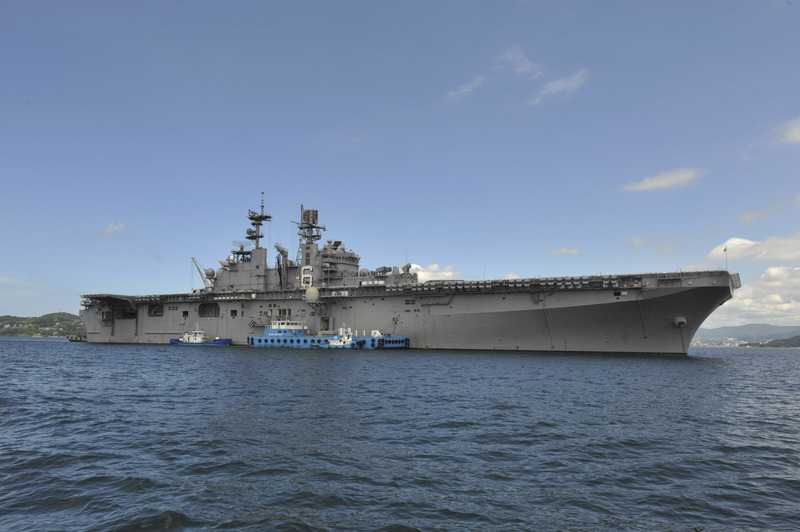 174k USS Bonhomme Richard (LHD-6) departs Fleet Activities Sasebo. 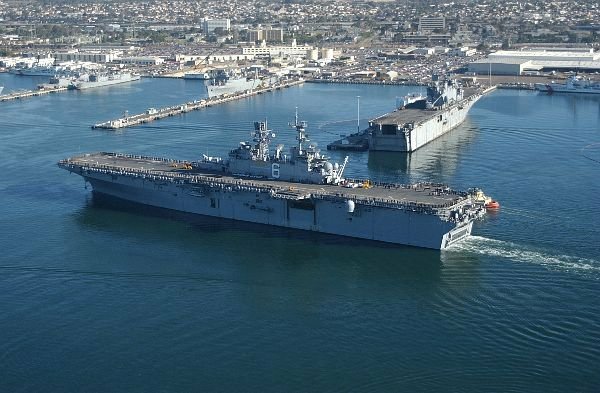 Bonhomme Richard has been the flagship of the Amphibious Force 7th Fleet since April 2012 and will now sail to her new homeport in San Diego for follow-on operations and eventual upgrades to become F-35B Lightning II capable. 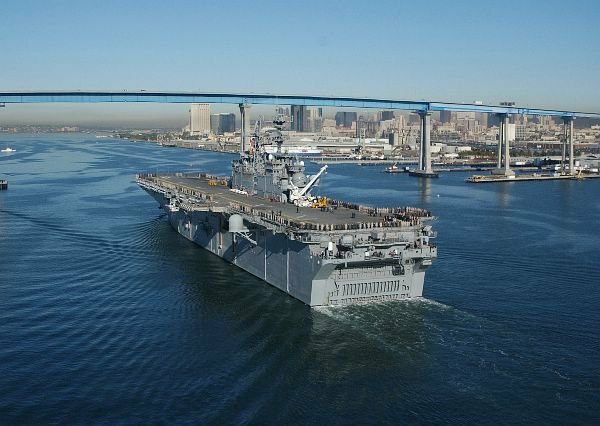 175k USS Bonhomme Richard (LHD-6) arrives in San Diego, Calif. Bonhomme Richard, which had been forward-deployed since 2012 as the Amphibious Force 7th Fleet flagship, has completed a homeport shift and arrived at San Diego where she is scheduled to undergo upgrades to operate the F-35B Lightning II. 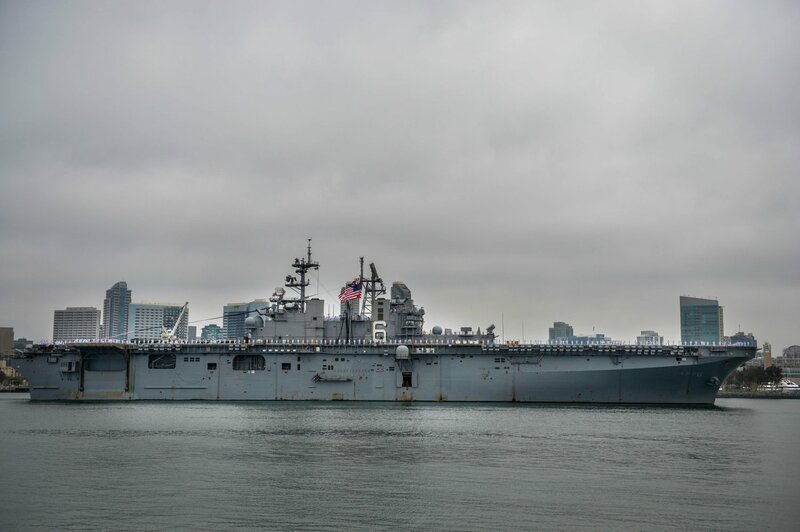 214k USS Bonhomme Richard (LHD-6) arrives at San Francisco, CA. signifying the arrival of Marines and Sailors participating in San Francisco Fleet Week 2018, Sept. 30, 2018. 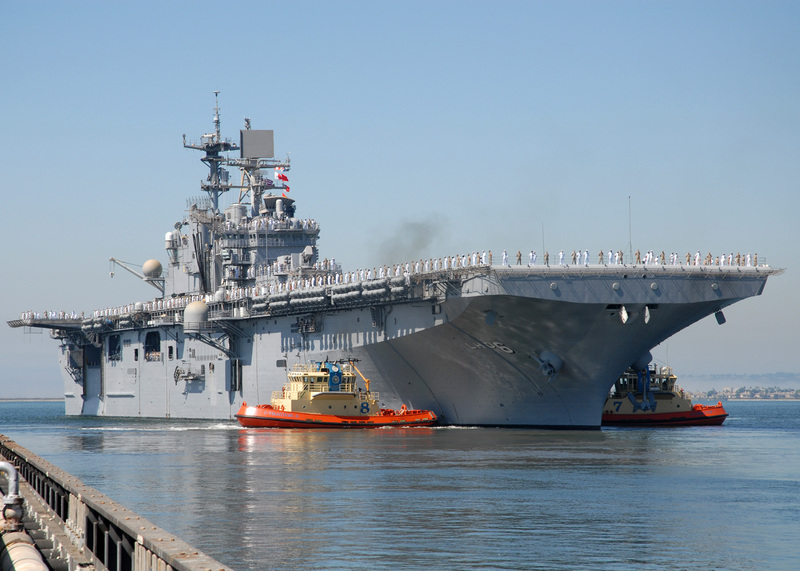 San Francisco Fleet Week provides an opportunity for the American public to meet their Marine Corps. 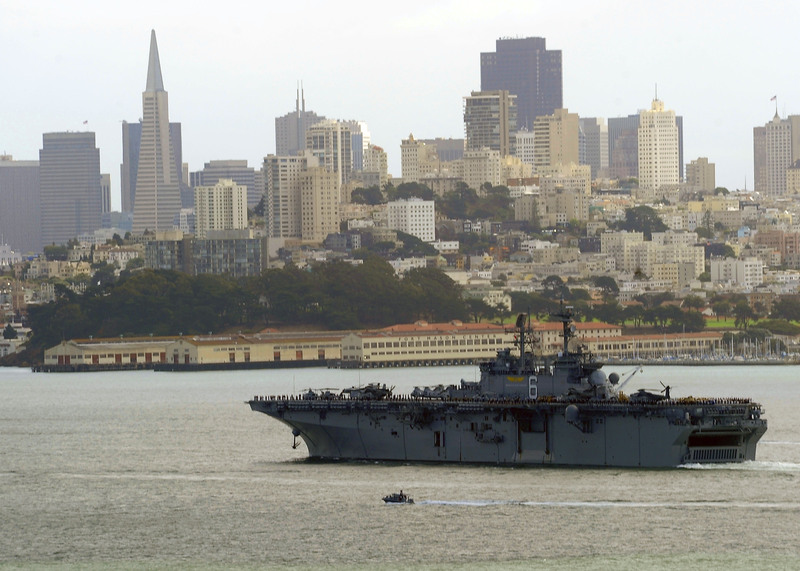 Fleet Week San Francisco will highlight naval personnel, equipment, technology and capabilities, with an emphasis on humanitarian assistance and disaster response. 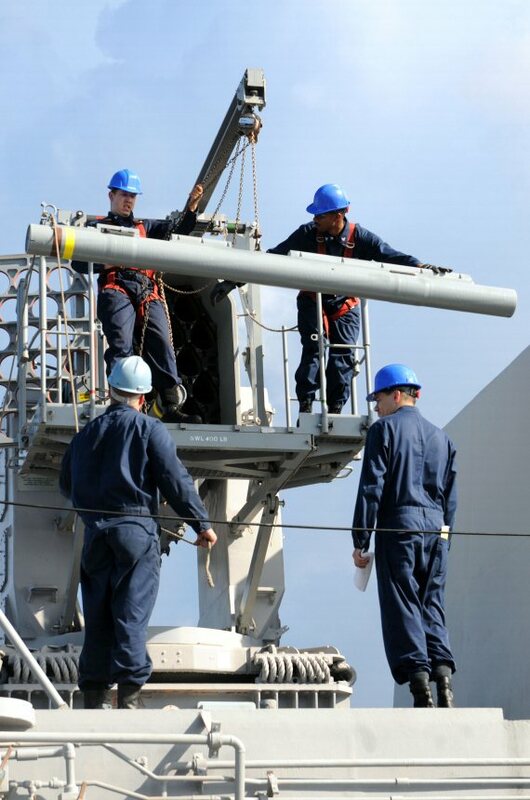 Navy News Story NNS120723-11 Released 7/23/2012 "Mine Warfare Group Helps in Search for Bonhomme Richard"